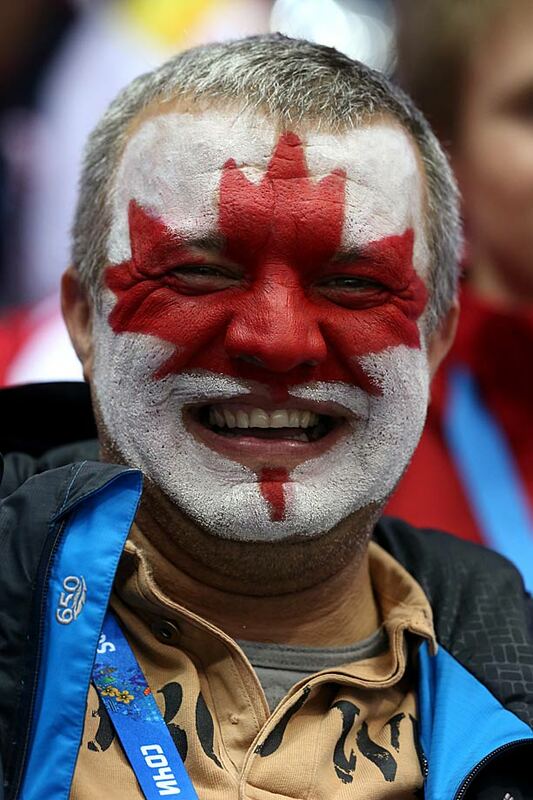 A Canada fan attends the hockey semifinal game between Canada and the United States. 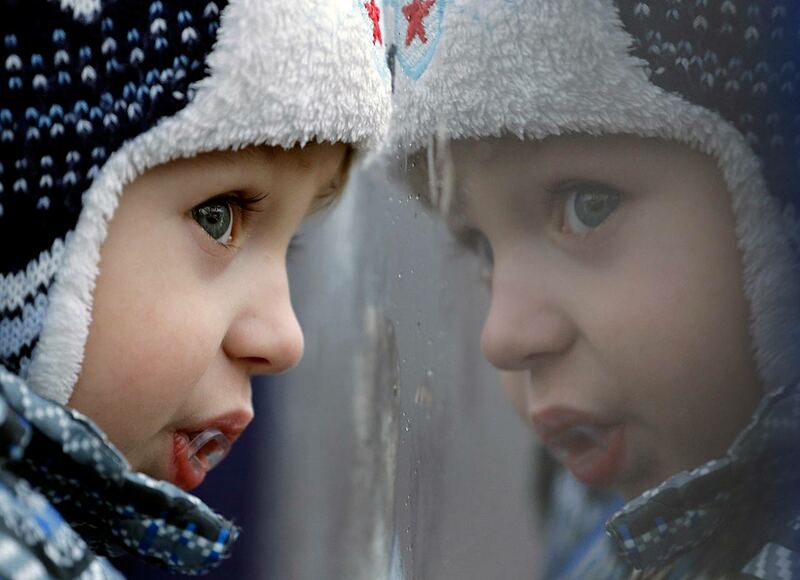 Two-year-old Aleksandr Olegovich looks out a rain-covered gondola window as he travels with his family to watch the women's slalom on Friday, Feb. 21. 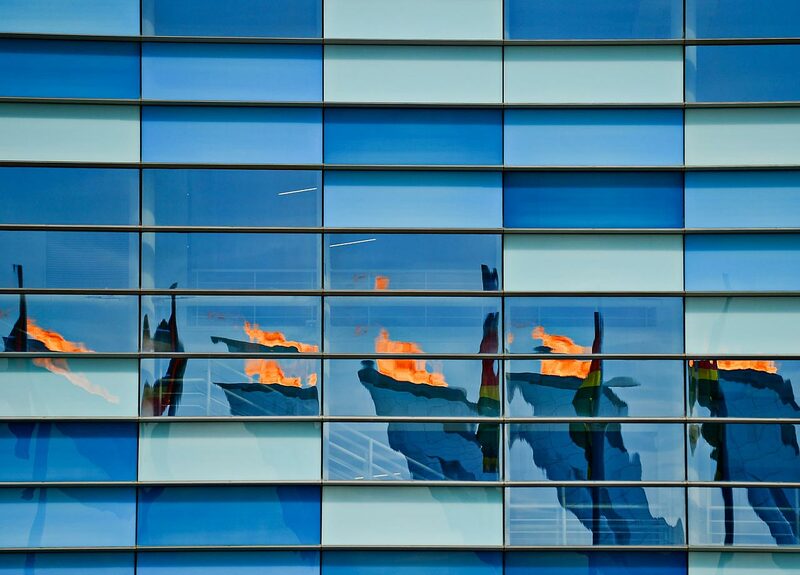 A fan takes a picture during Switzerland vs. Sweden in the bronze medal women's hockey game. 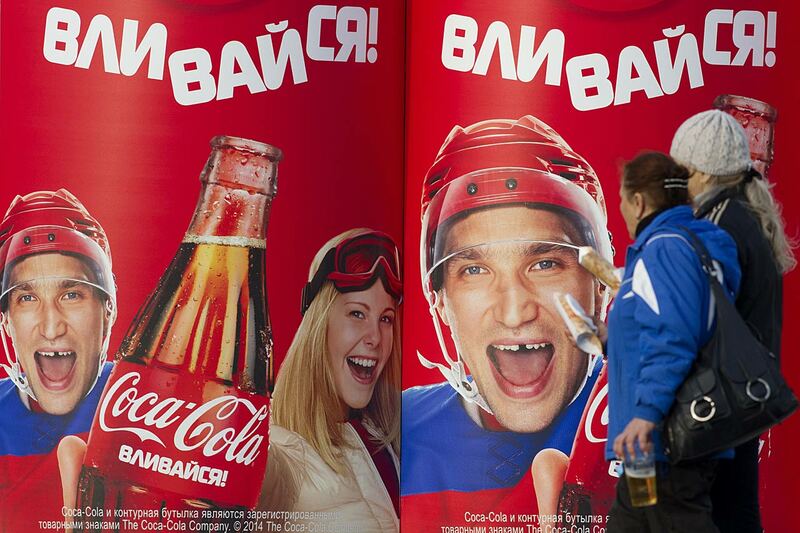 Fans stop to take in an Alex Ovechkin co-sponsored advertisement. 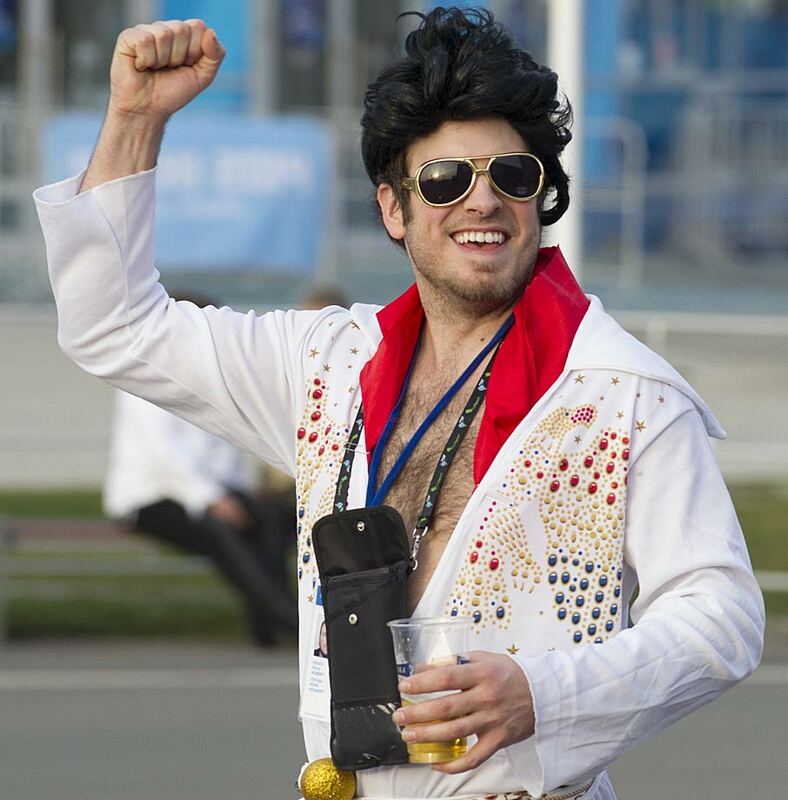 As Elvis impersonators go, this one doesn't win a gold medal. 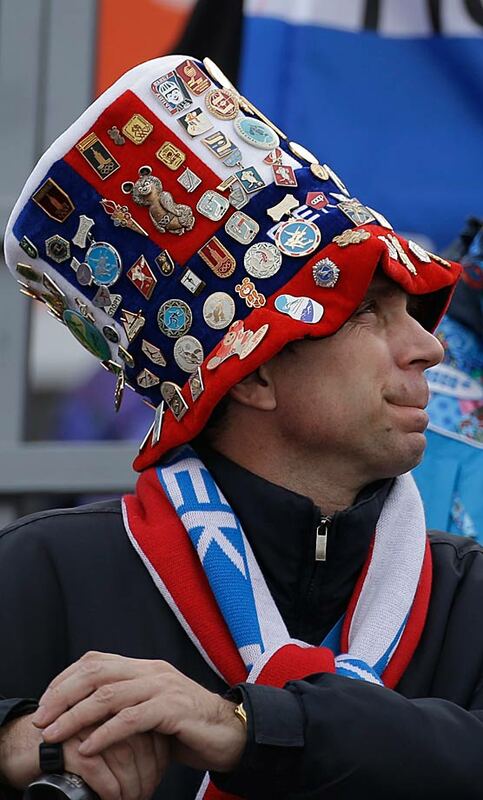 A fan with numerous pins on his hat watches the ski jumping portion of the Nordic combined Gundersen large hill team competition. 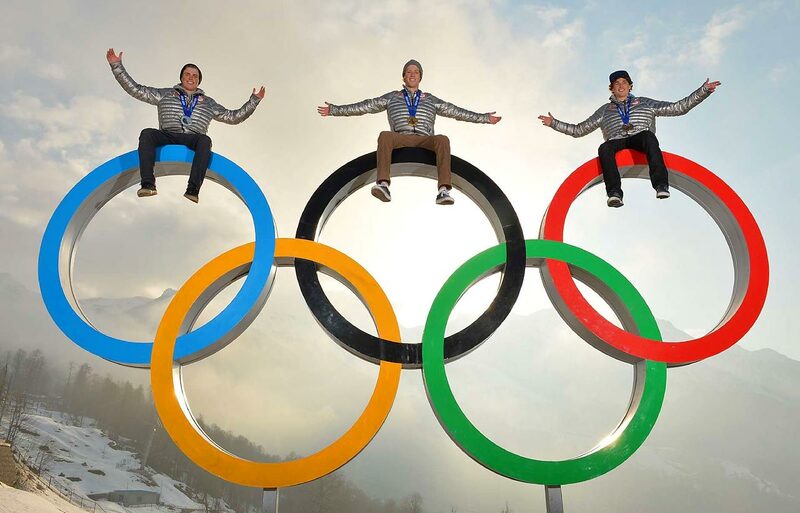 Gold medalist Joss Christensen (center), silver medalist Gus Kenworthy (left) and bronze medalist Nicholas Goepper pose for a photo shoot. 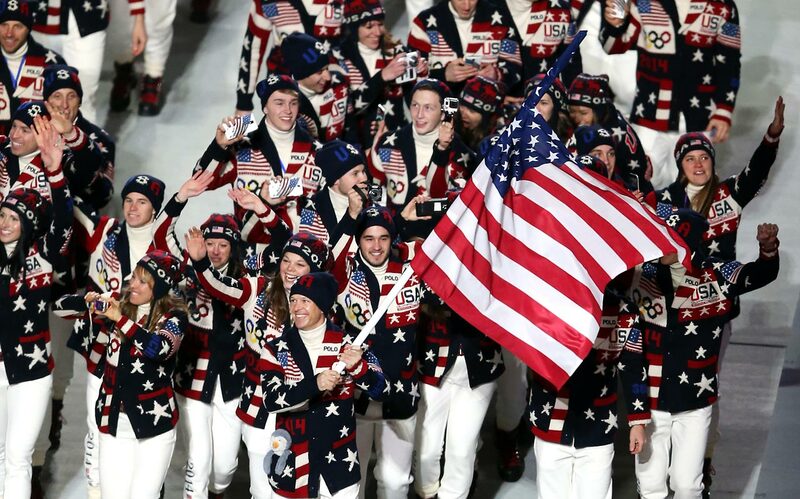 They became only the third U.S. trio to sweep the podium at a Winter Olympic event. 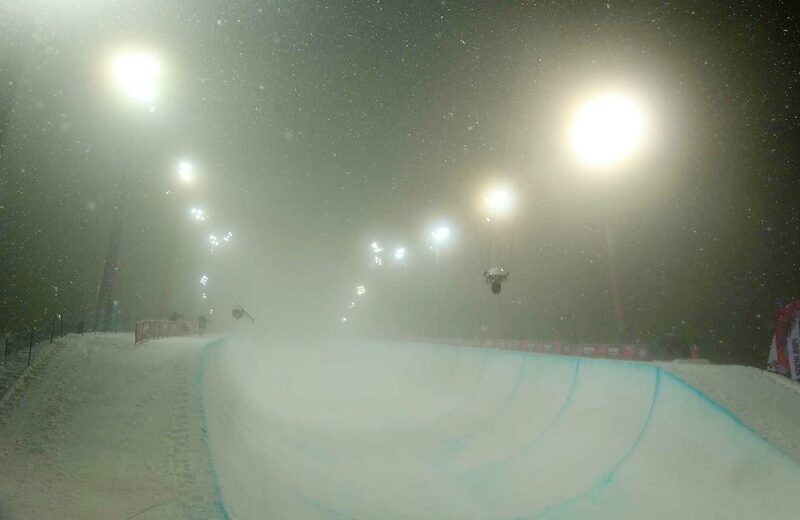 Foggy night at the Men's Halfpipe final. 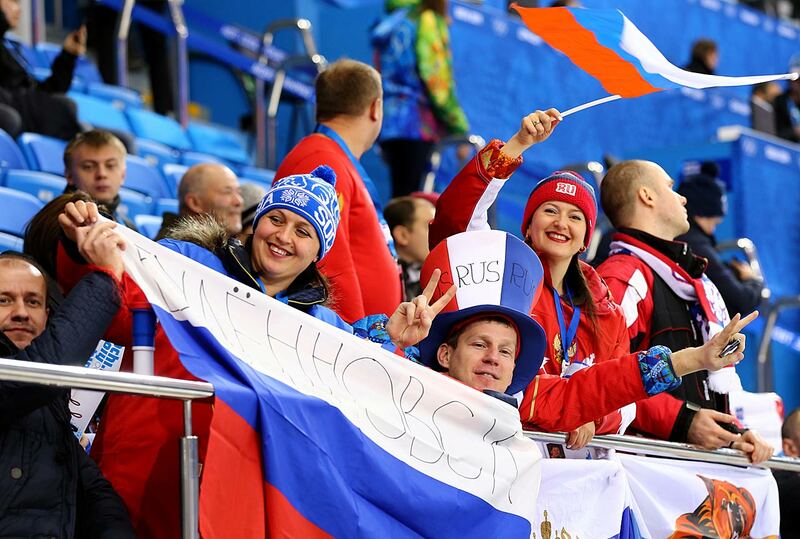 Fans watching Russia play Norway in hockey. 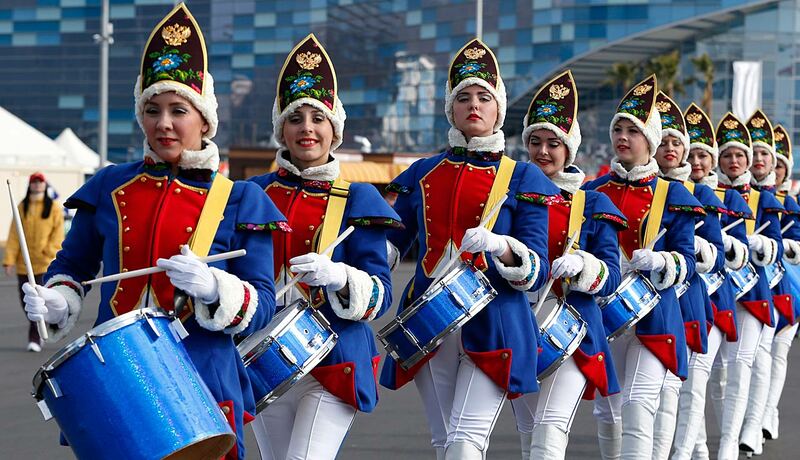 Women drummers march near medals plaza in Olympic Park at the 2014 Winter Olympics. 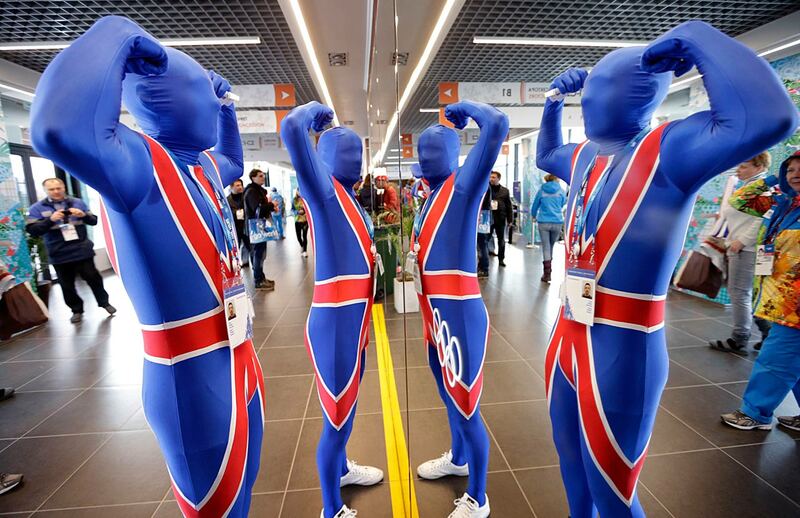 Scott Philip and Robin Dyet of Scotland flex their muscles in a mirror at the Ice Cube Curling Center prior to curling competition between Britain and China. 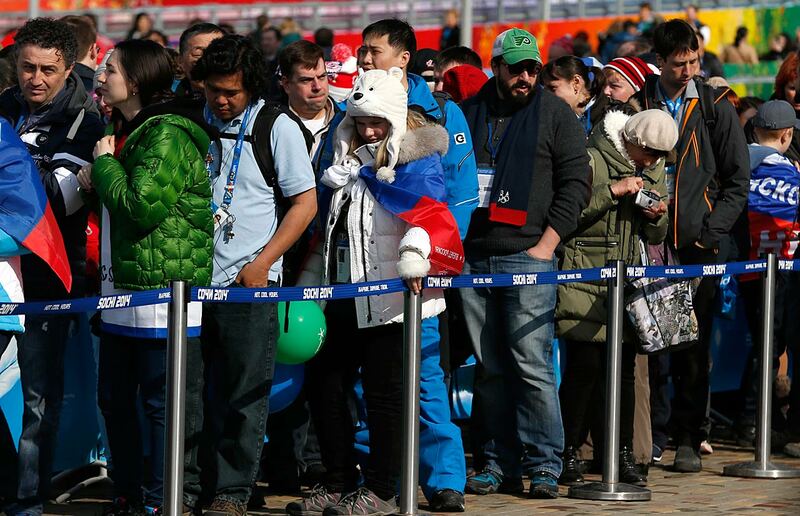 People wait in a long line outside a gift shop at Olympic Park. 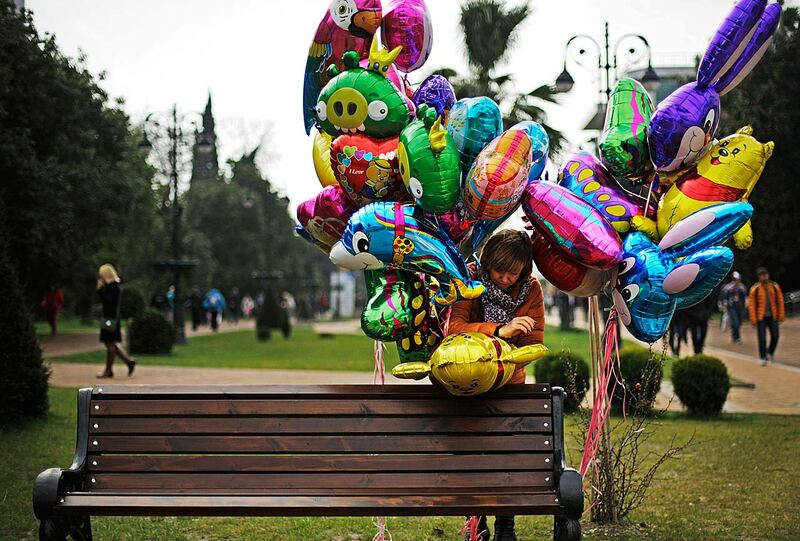 A vendor prepares a bunch of balloons for display along a pedestrian mall. 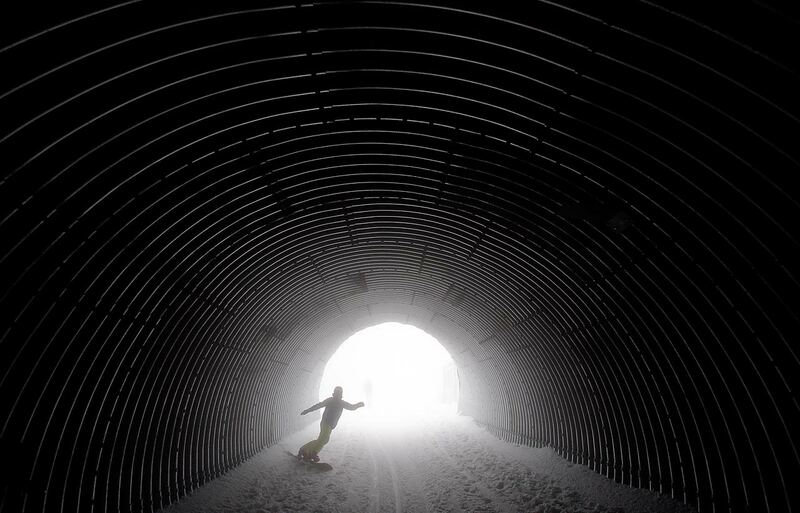 A snowboarder goes through a tunnel near the alpine skiing training slopes. 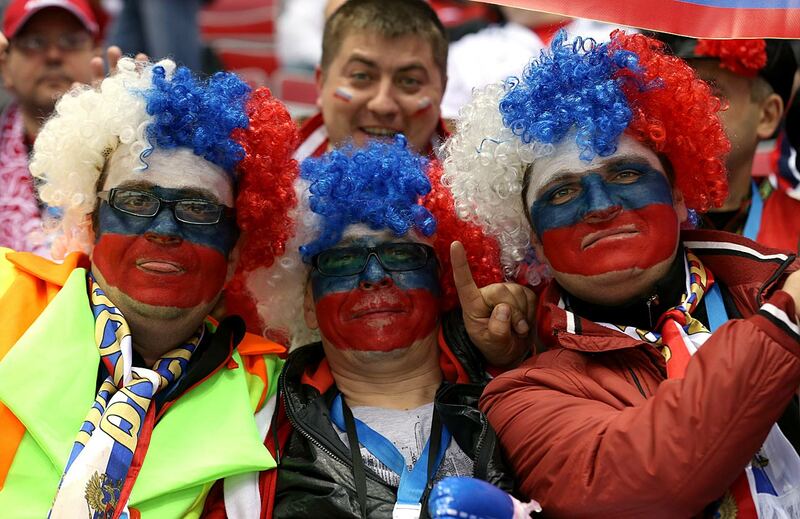 Fans attend the Group A hockey game between Russia and Slovakia. 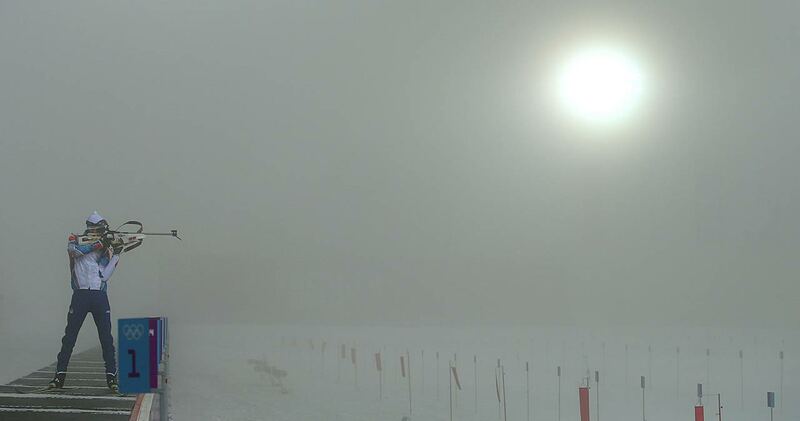 Fog forced postponement of the men's 15 km Mass Start on Sunday, Feb. 16. 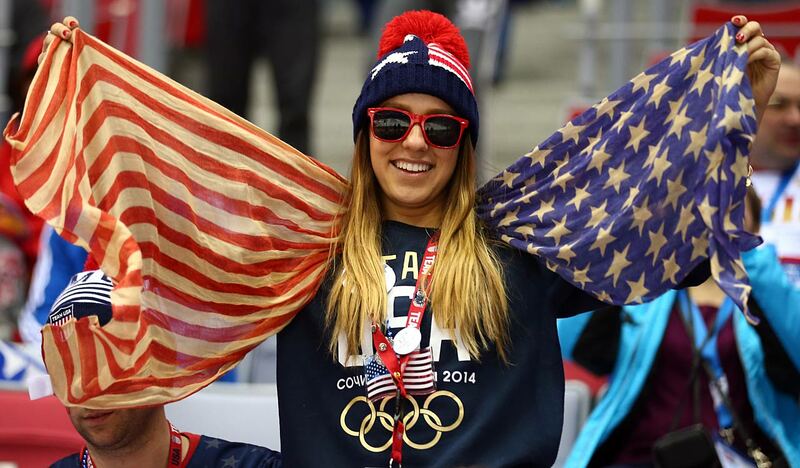 An American fan shows her colors during the U.S.-Russian hockey game. 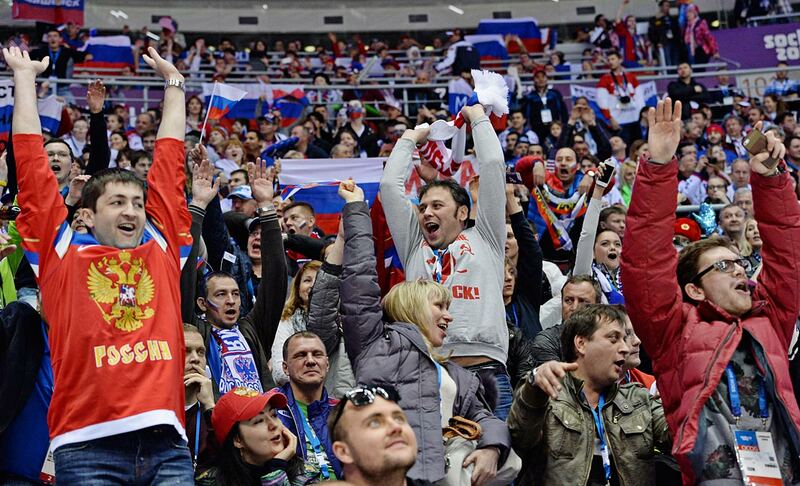 A group of Russian fans attempt to get the wave started during the U.S.-Russia preliminary hockey matchup. 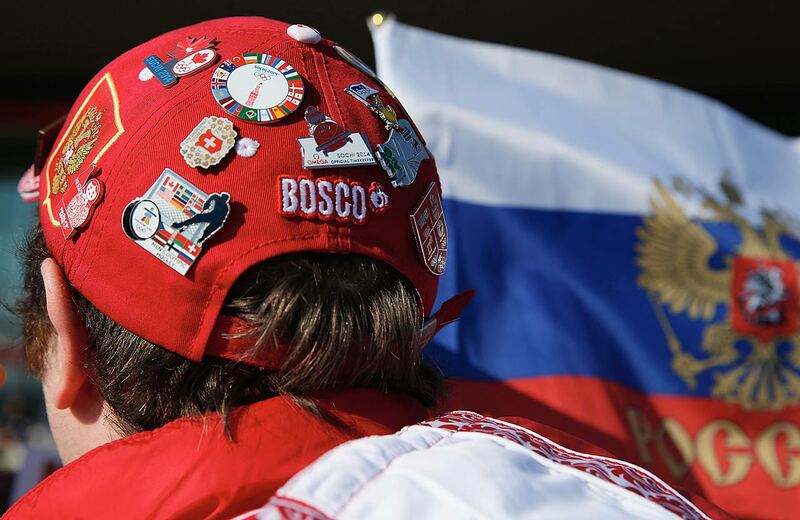 A Russian fan holds up a flag before the game between Russia and the United States. 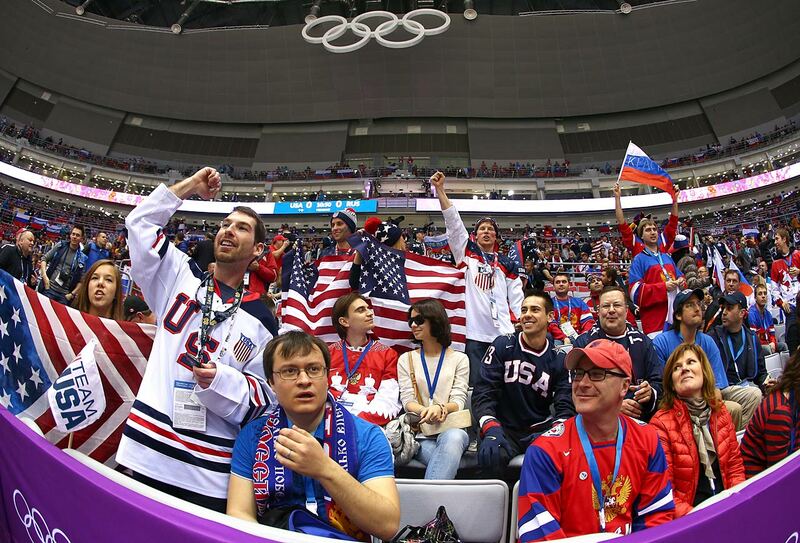 American and Russian fans filled the Bolshoy Ice Dome for the preliminary round hockey game between the two countries. 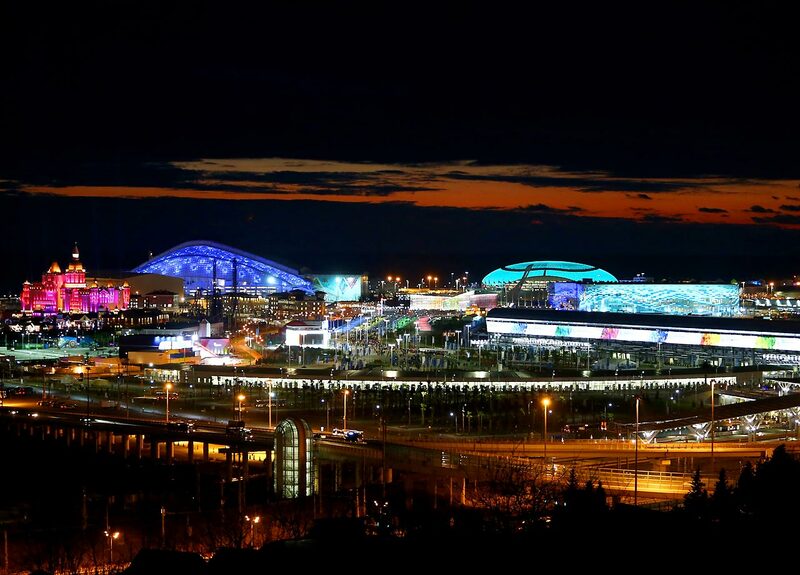 Switzerland women's hockey team warms up in Olympic Park before it's game against Russia. 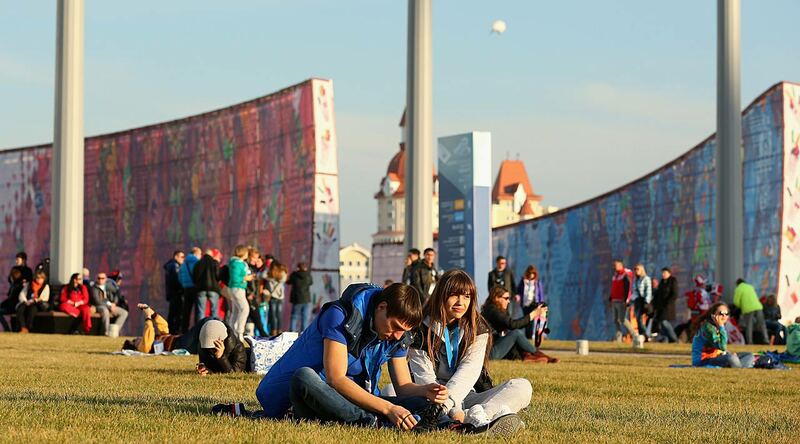 Spectators relax on the grass in Olympic Park on Valentine's Day. 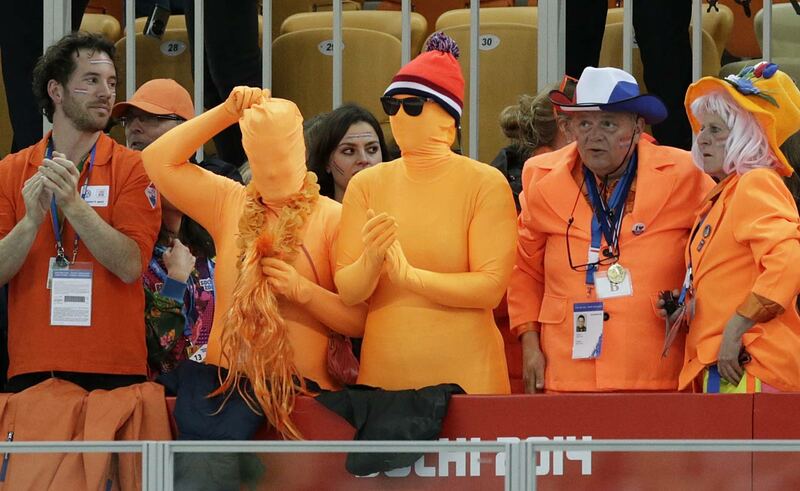 Dutch skating fans cheer for their country skater during the women's 1,000-meter speedskating race at the Adler Arena Skating Center. 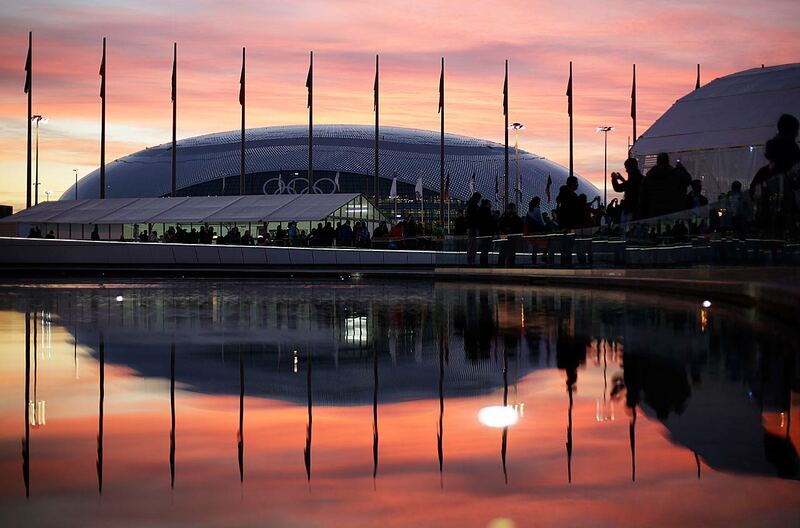 The sun sets as the Bolshoy Ice Dome is reflected in a pool of water underneath the Olympic cauldron. 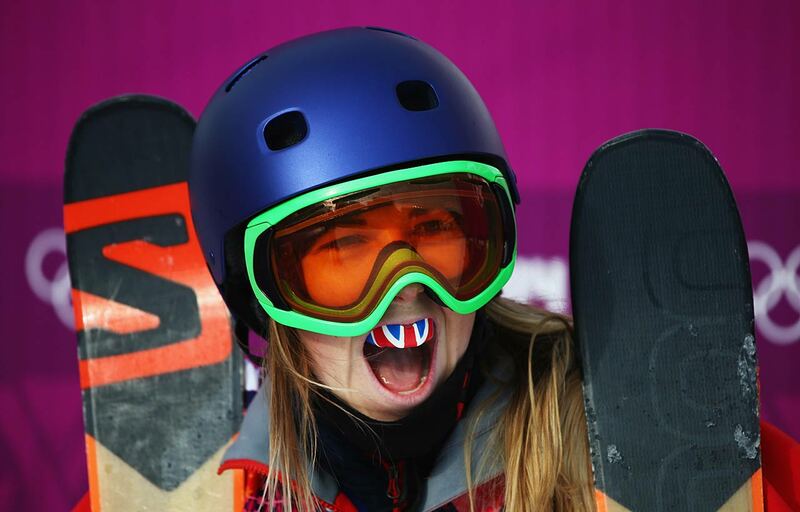 Katie Summerhayes of Great Britain ceebrates during the Freestyle Skiing Women's Slopestyle Qualification. 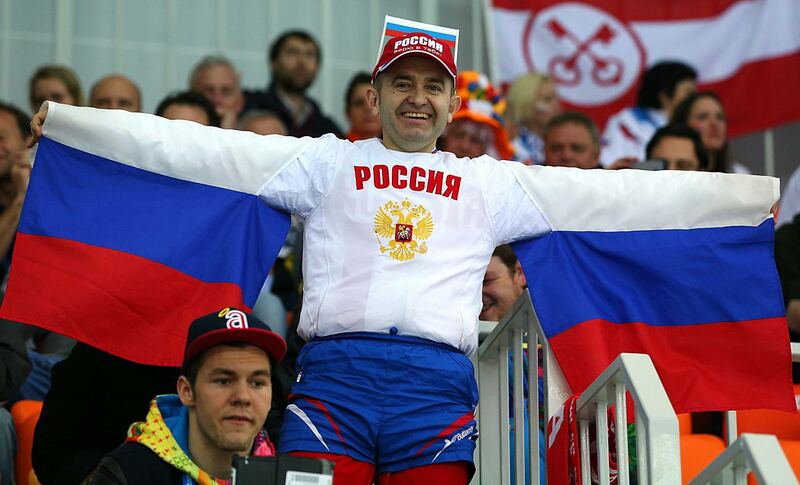 A fan enjoys the atmosphere during the women's 500m Speed Skating event. 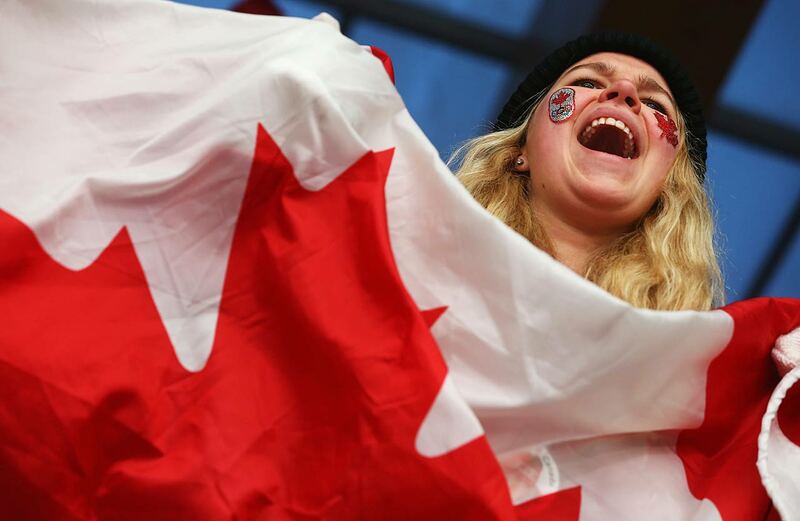 A Canada fan cheers in the finish area during the women's Luge Singles. 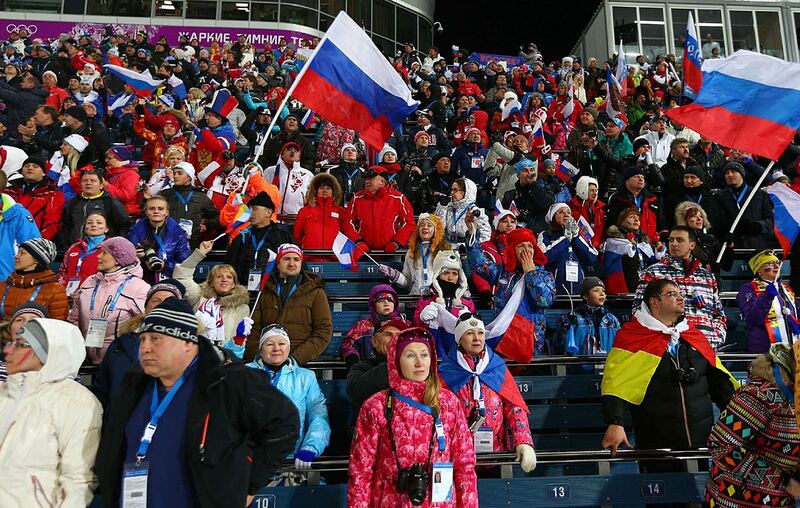 Fans look on during the Freestyle Skiing Women's Ski Slopestyle Finals. 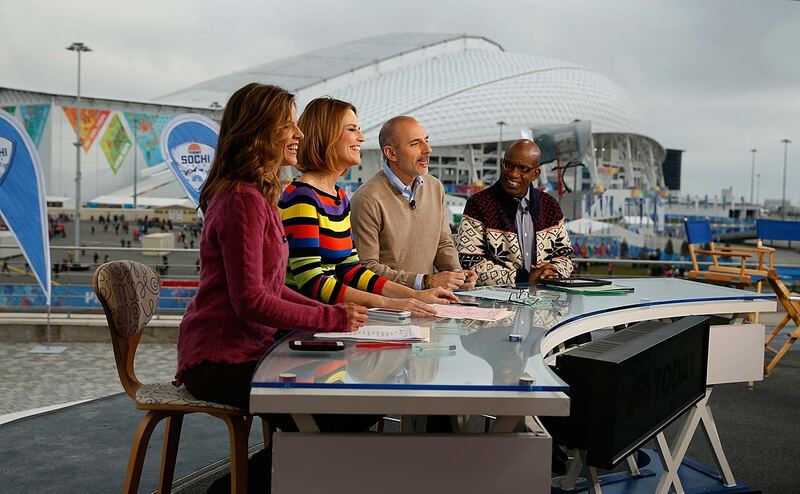 Natalie Morales, Savannah Guthrie, Matt Lauer and Al Roker wait on the set of the NBC TODAY Show. 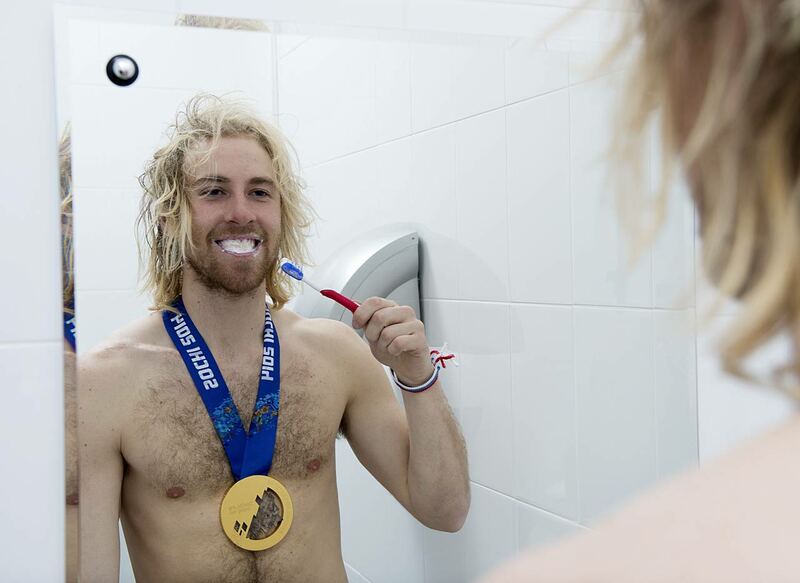 Sage Kotsenburg, the gold medal winner in the slopestyle, tries a new morning routine. 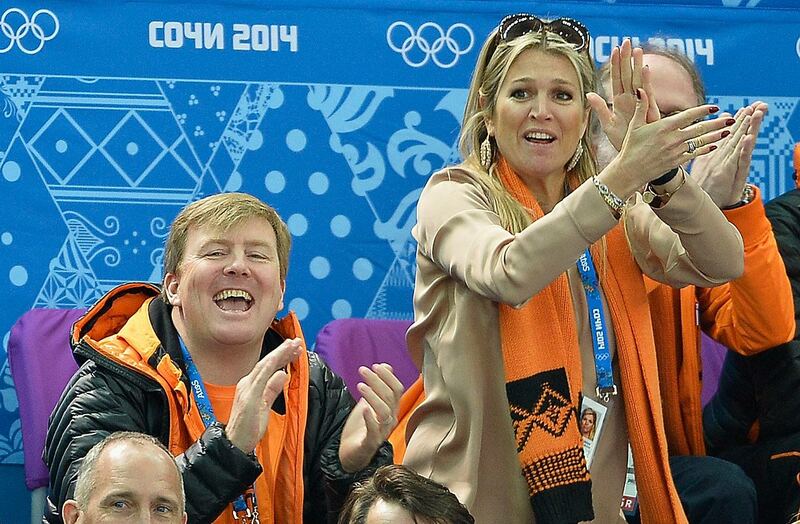 King Willem-Alexander of the Netherlands and Queen Maxima of the Netherlands attend the Short Track at Iceberg Skating Palace. 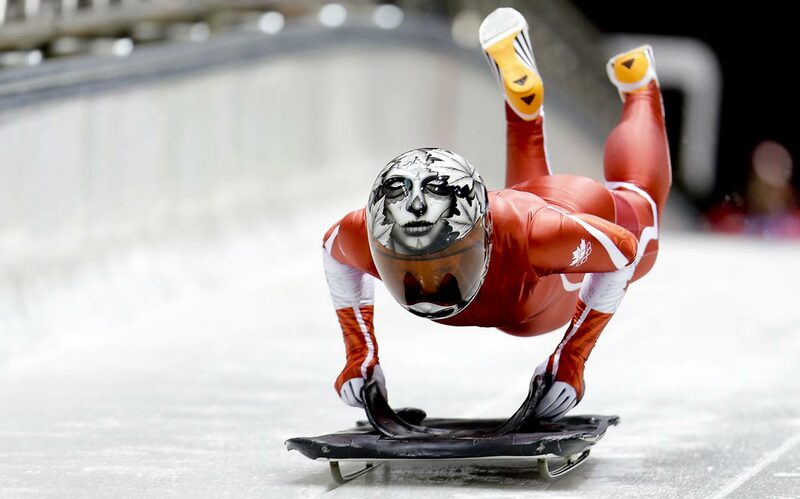 Swiss goalkeeper Sophie Anthamatten is transported to the hockey training center. A young woman does a cheer at a women's ice hockey game. 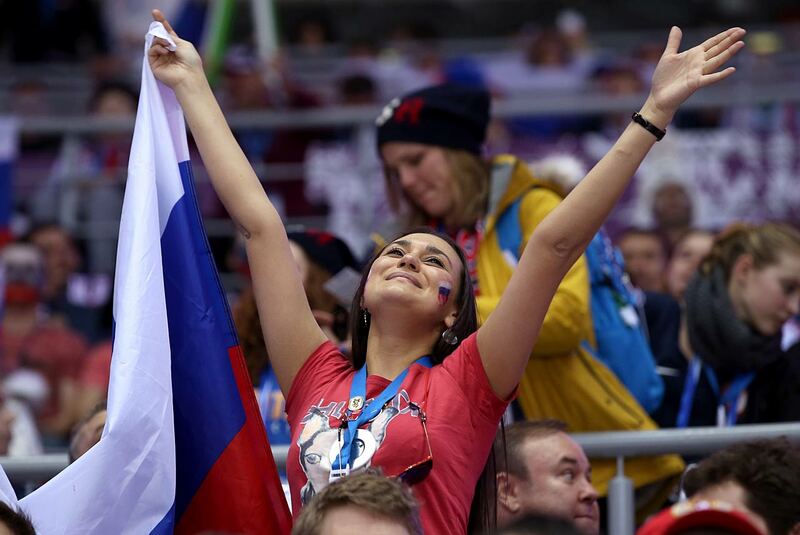 Fans of Team Russia cheer during their women's hockey team's game against Germany. 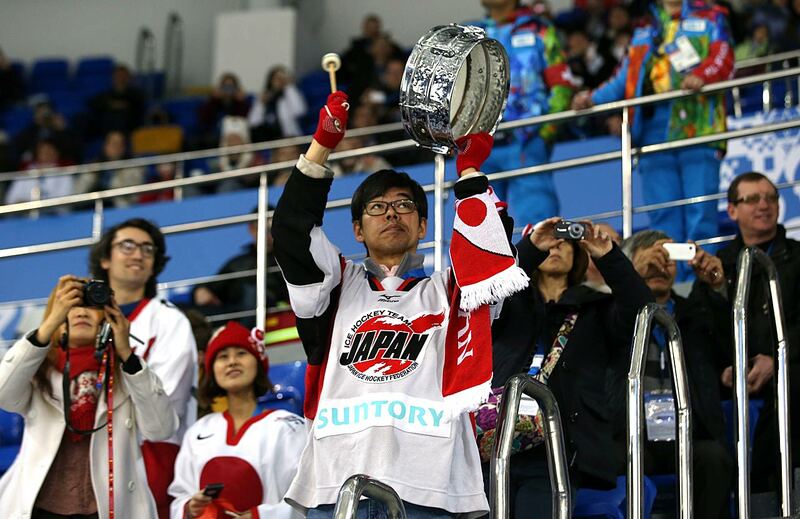 Japanese fans cheer during their team's hockey game against Sweden. 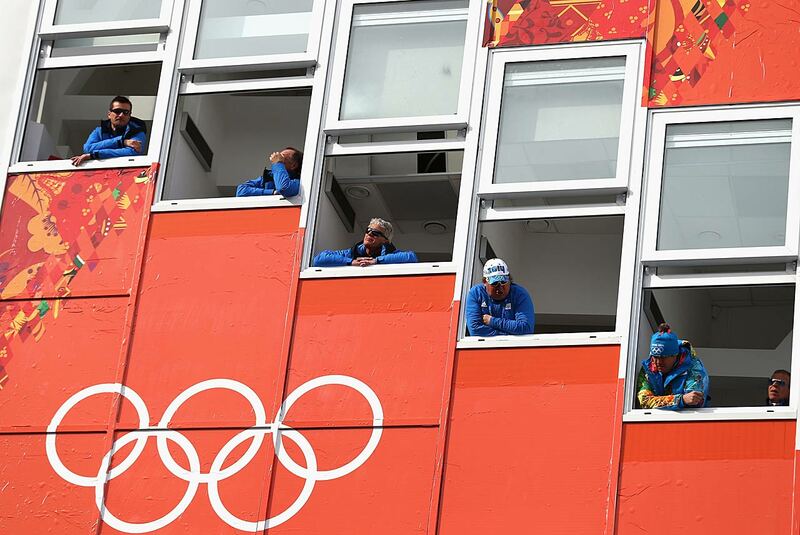 Judges look on during the Ladies' Normal Hill Individual Ski Jumping training on day 2 of the Sochi 2014 Winter Olympics . 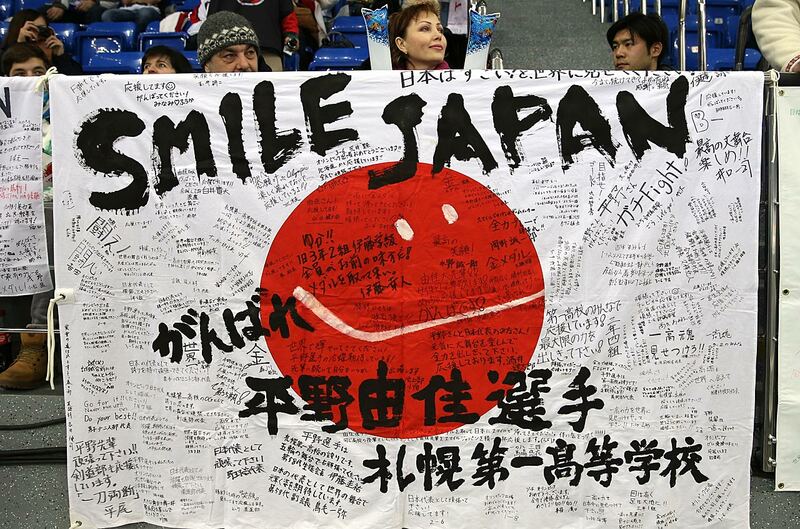 Fans cheer prior to a women's ice hockey preliminary round game between Japan and Sweden. 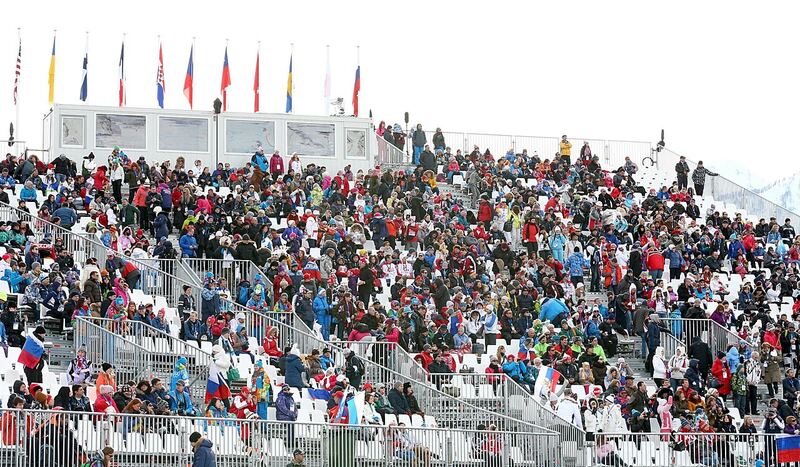 The crowd during the women's Snowboard Slopestyle competition. 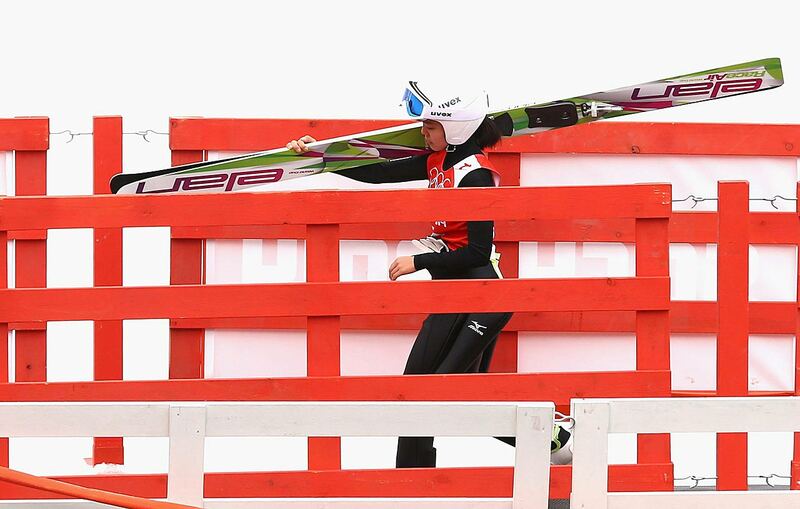 Sara Takanashi of Japan walks to the chairlift during the Ladies' Normal Hill Individual Ski Jumping training. 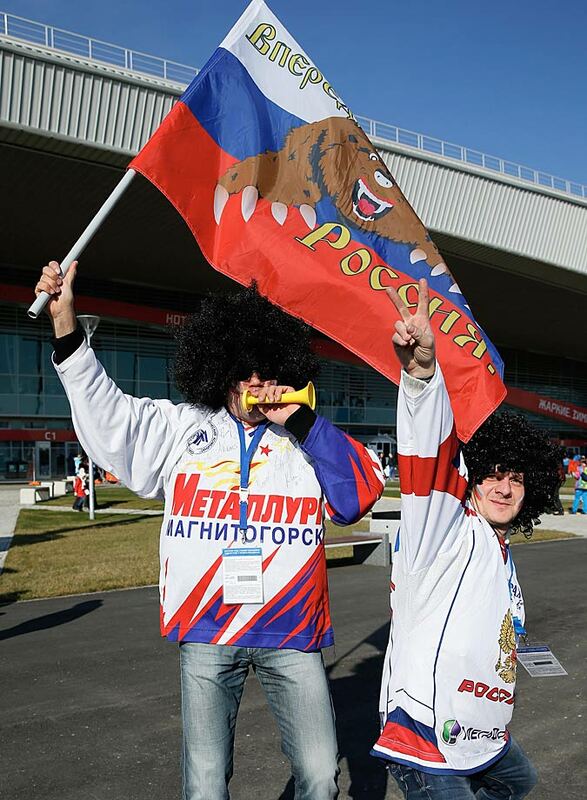 Russian hockey fans pose inside Olympic Park. 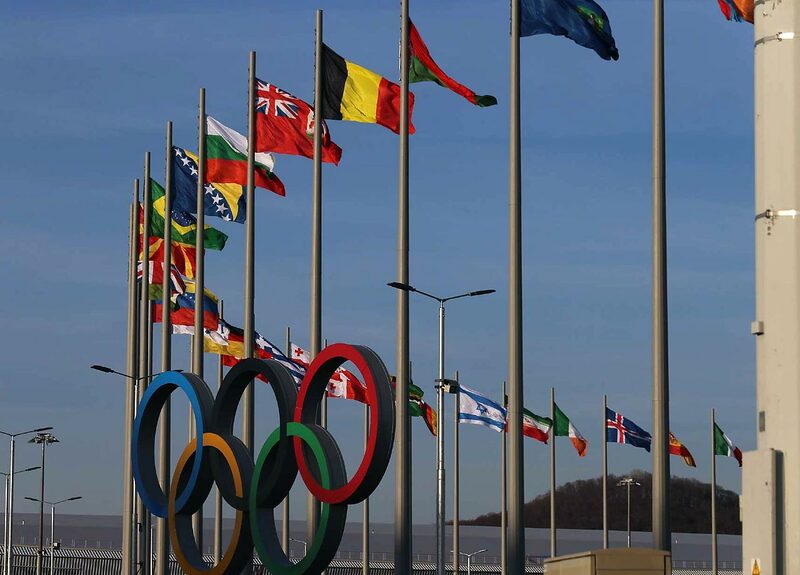 A fan is seen inside Olympic Park with his share of Olympic pins. 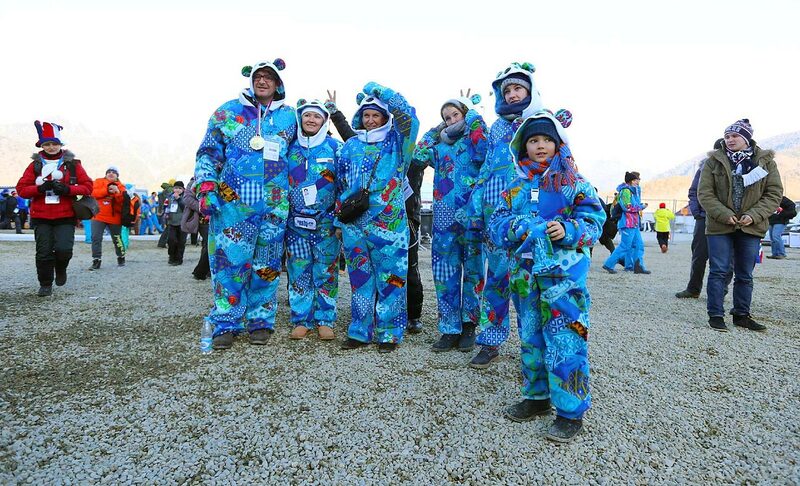 A couple of fans show their enthusiasm on the first full day of events. 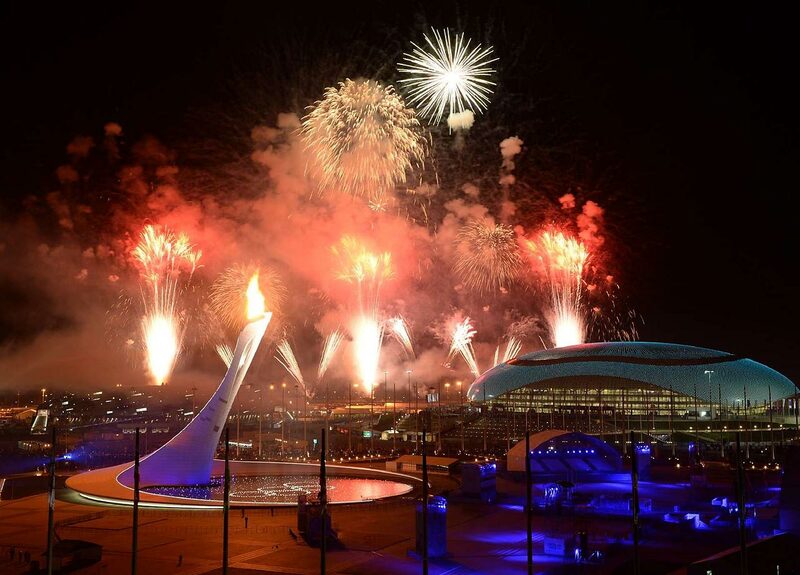 The Opening Ceremonies of the Sochi Games featured a magnificent fireworks display. 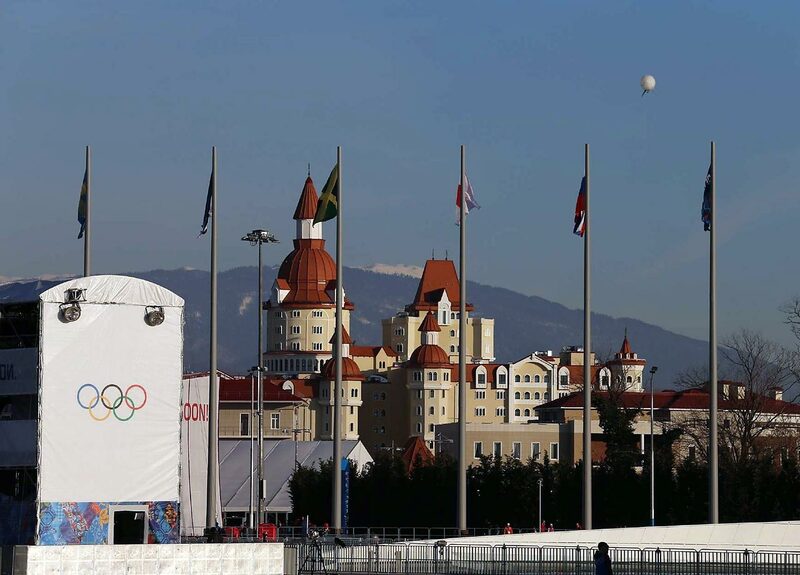 The U.S. delegation was led by flag-bearer Todd Ludwick. 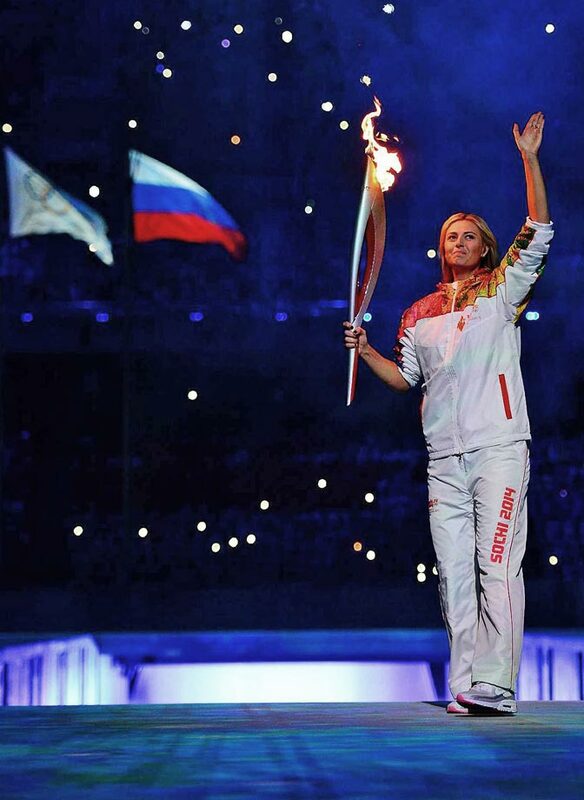 Maria Sharapova was one of the torch bearers during the Opening Ceremonies. 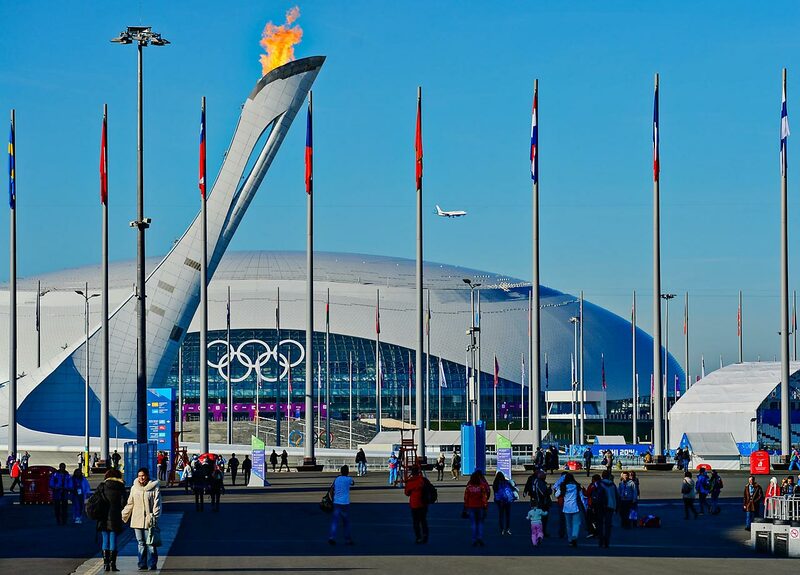 Eighty-five countries are competing in the Sochi Games, which feature 98 events, 12 of which are new. 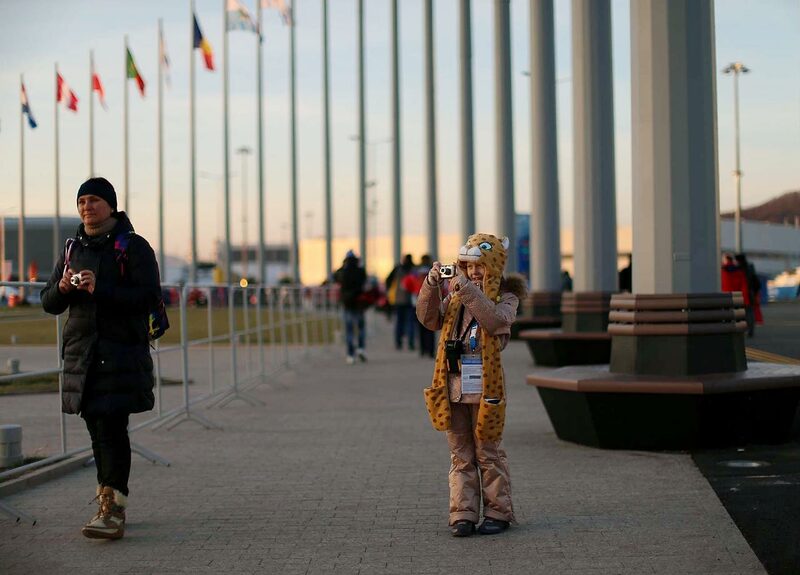 A young fan captures memories of the games with her camera. 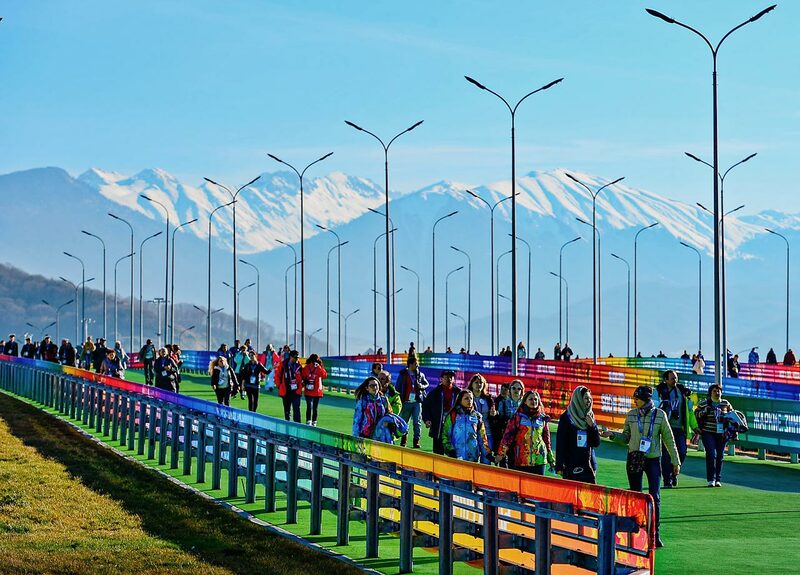 The average temperature in Sochi for the games is expected to be 48 degrees, which would be the warmest ever for a Winter Olympics. 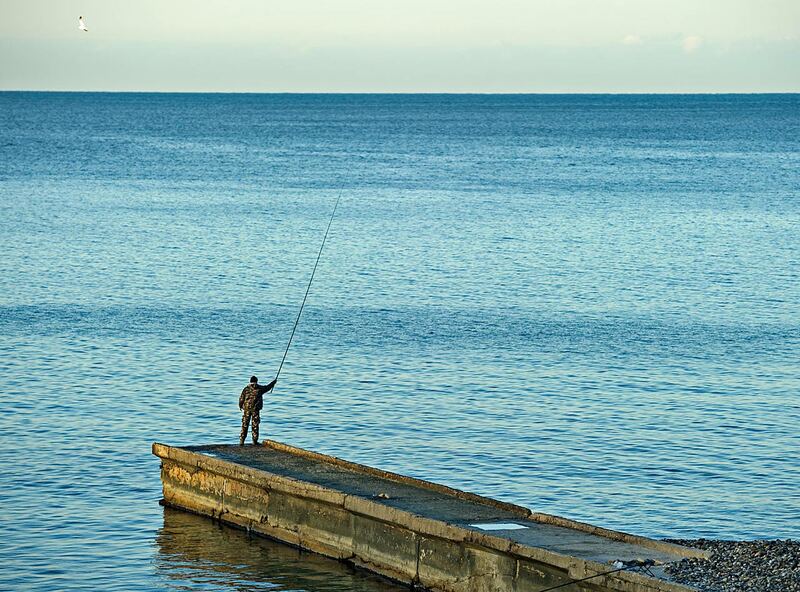 While most concerned themselves with the games at hand, a man chose instead to do a little fishing. 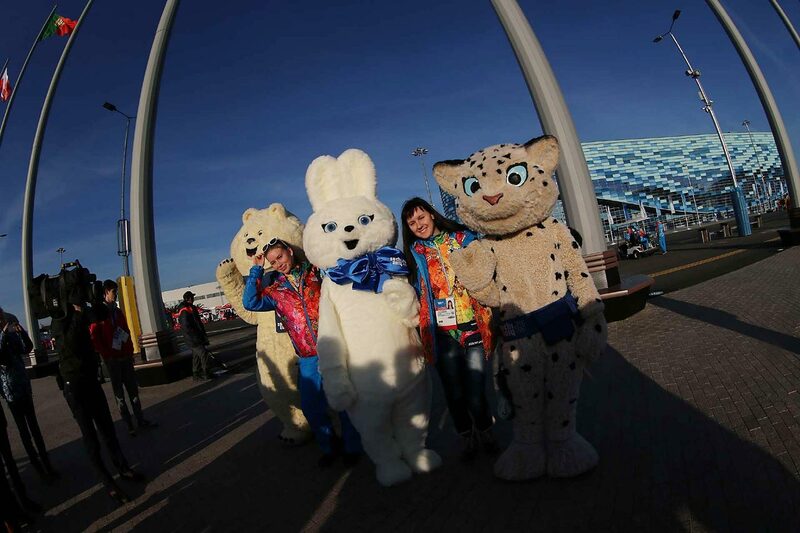 The mascots for the Sochi Games are polar bears, hares and leopards. 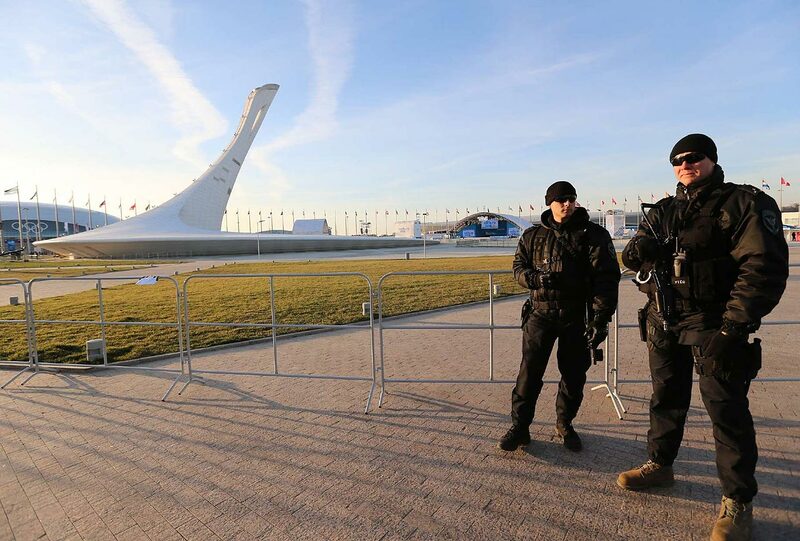 Security will be high at these Games. 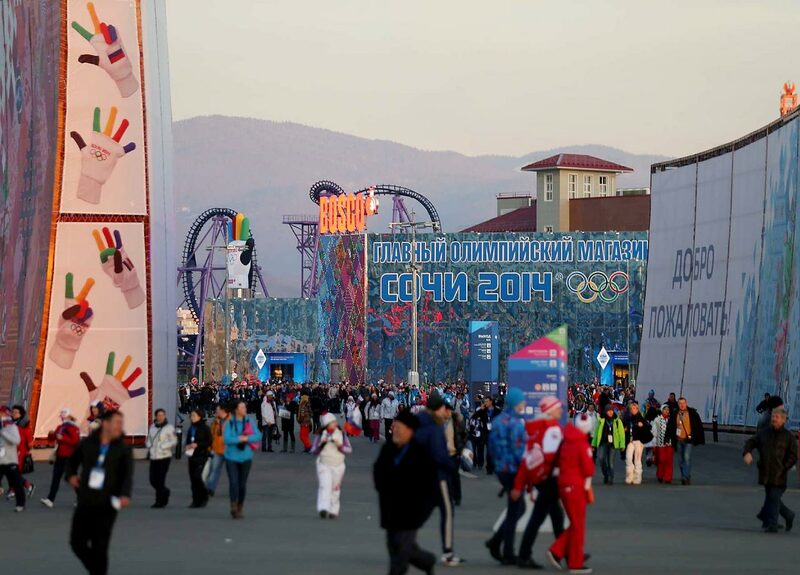 People stroll about before Friday's Opening Ceremonies. 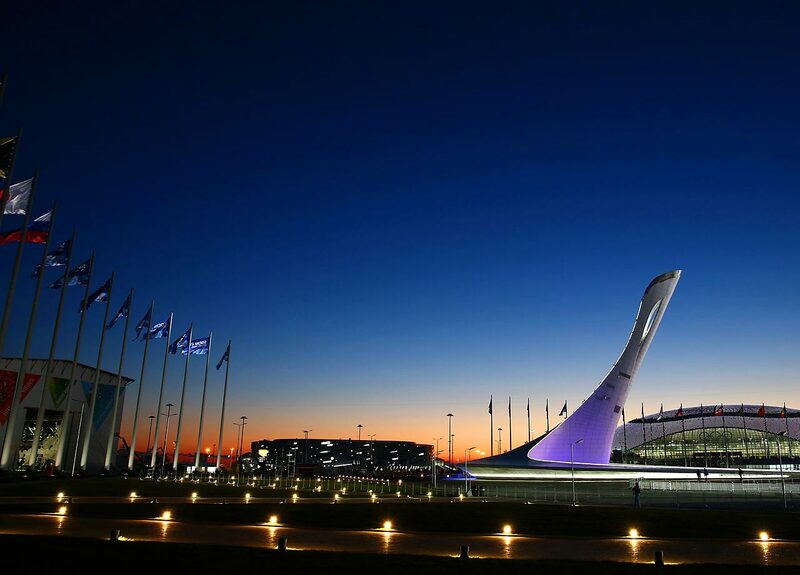 The buildings and stadia are lit up as the sun sets over the Olympic Park. 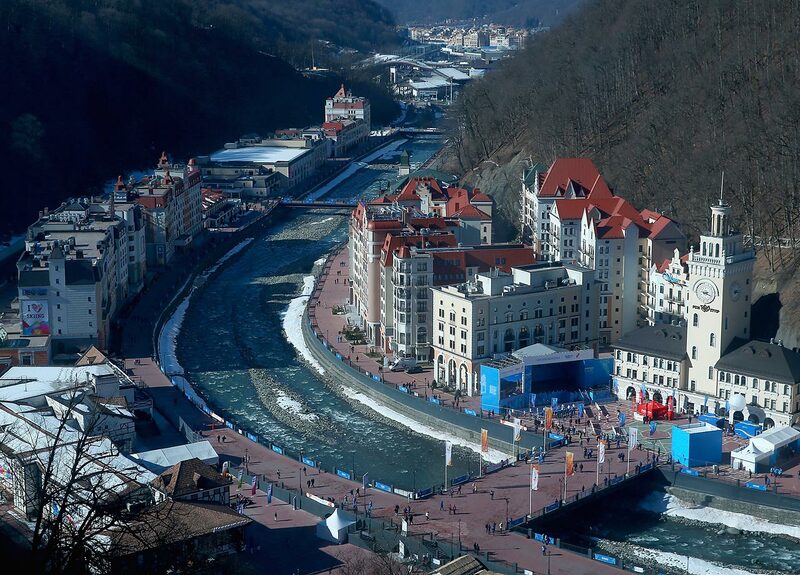 A general view of the Rosa Khutor Alpine Village. 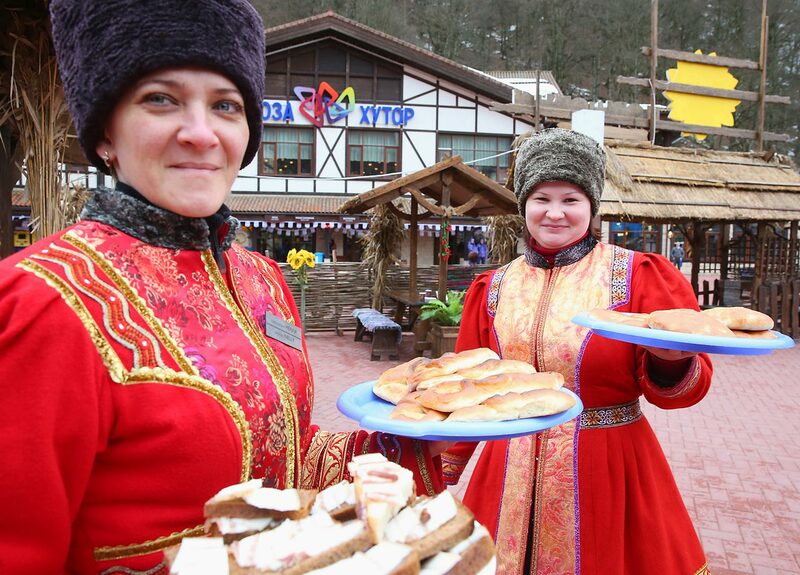 Women dressed in their traditional Russian outfit serve local food at the center of the Rosa Khutor Mountain Cluster village. 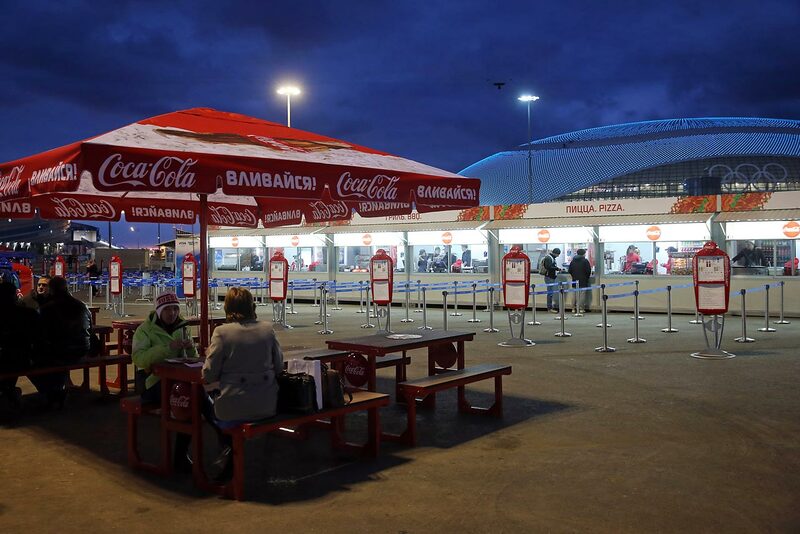 A snack bar inside Olympic Park in front of the Bolshoy Ice Dome. 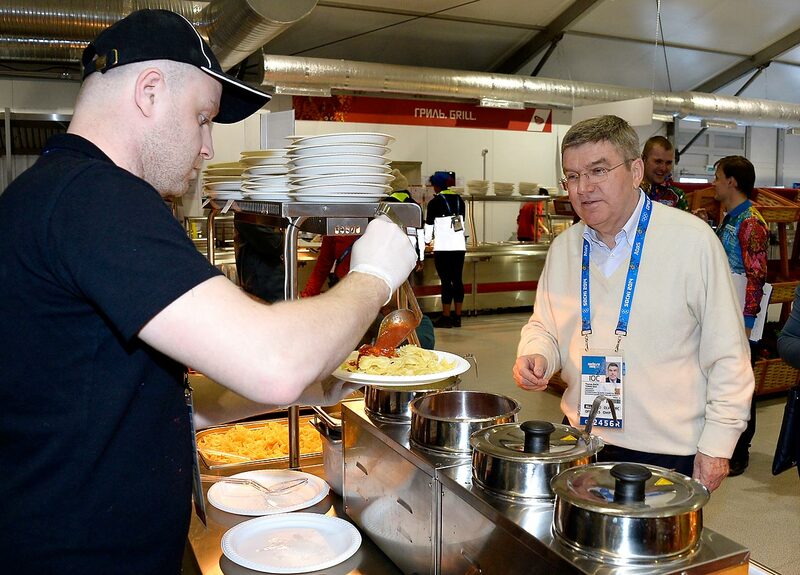 International Olympic Committee President Thomas Bach is served lunch in the Athletes Olympic Village. 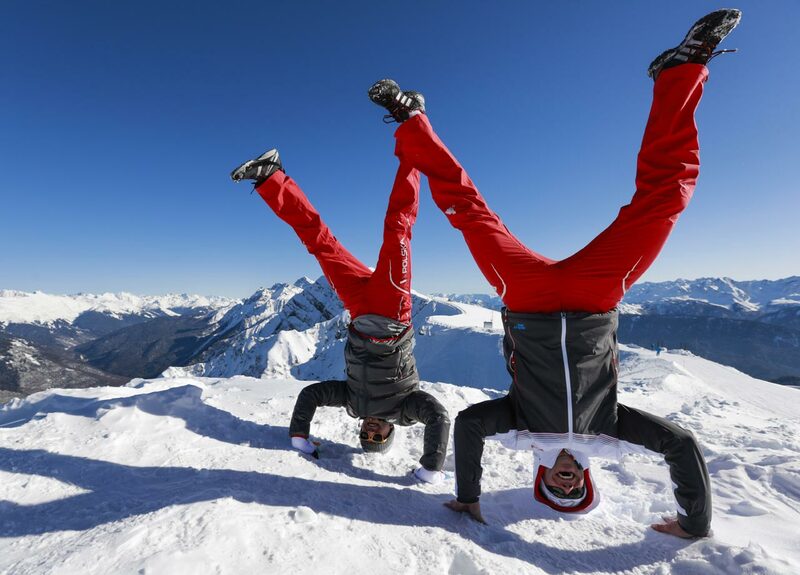 Bobsledder Pawel Mroz, right, and luger Karol Mikrut, both of Poland, do a handstand for a photograph on Rosa Peak, 2320 meters above sea level, at Rosa Khutor ski resort. Skiers take a break at Gornaya Karusel Ski Resort. 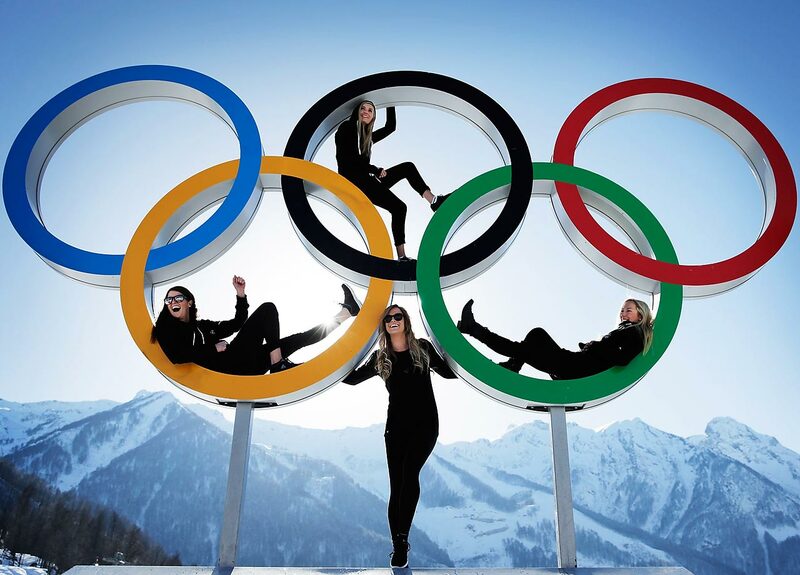 Shelly Gotlieb, Stefi Luxton, Christy Prior and Rebecca Torr of New Zealand pose for a picture with the Olympic Rings at Athletes Village. 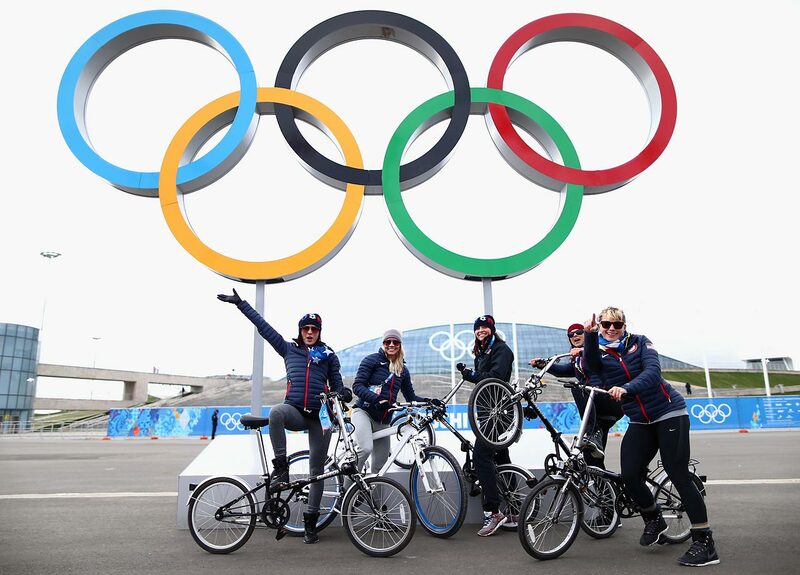 Short track speed skater Alyson Dudek, short track speed skater Emily Scott, speed skater Lauren Cholewinski, speed skater Brittany Bowe and speed skater Sugar Todd of the United States pose with bikes in front of the Olympic rings. 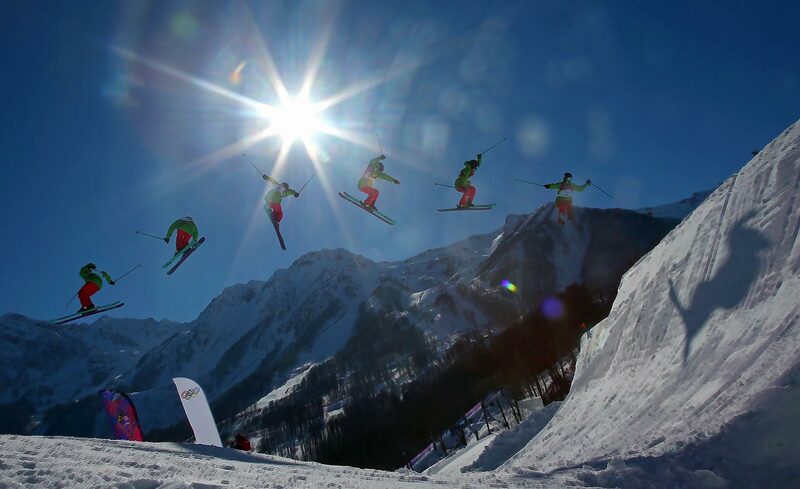 Kazakhstan's Igor Zakurdaev makes a jump during a men's downhill training run. 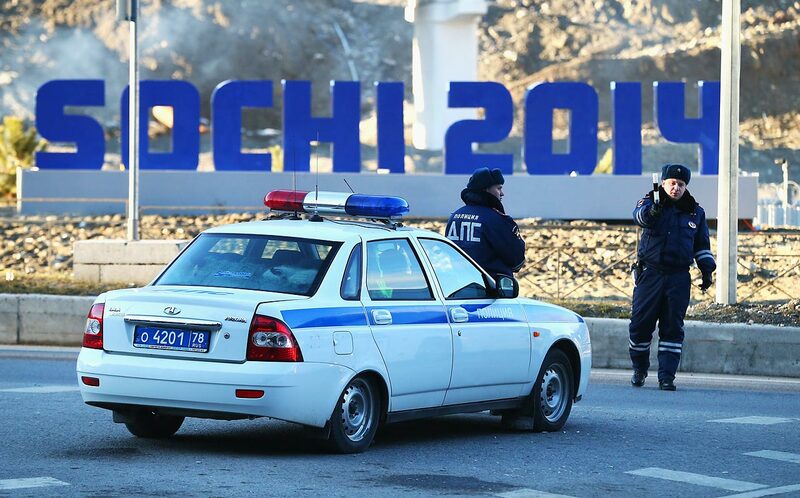 Police stop traffic near the Gorki Media Centre in the Rosa Khutor Moutain Clustera. 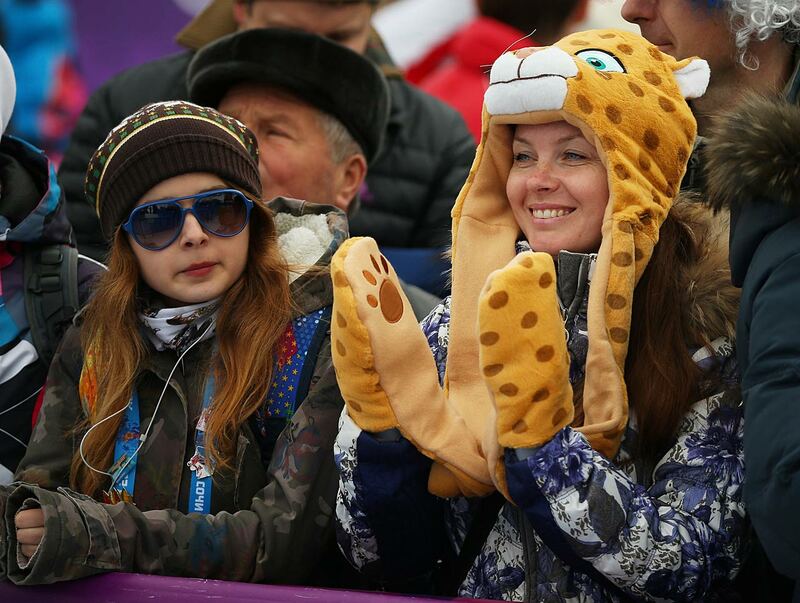 Spectators at the ladies moguls qualification. 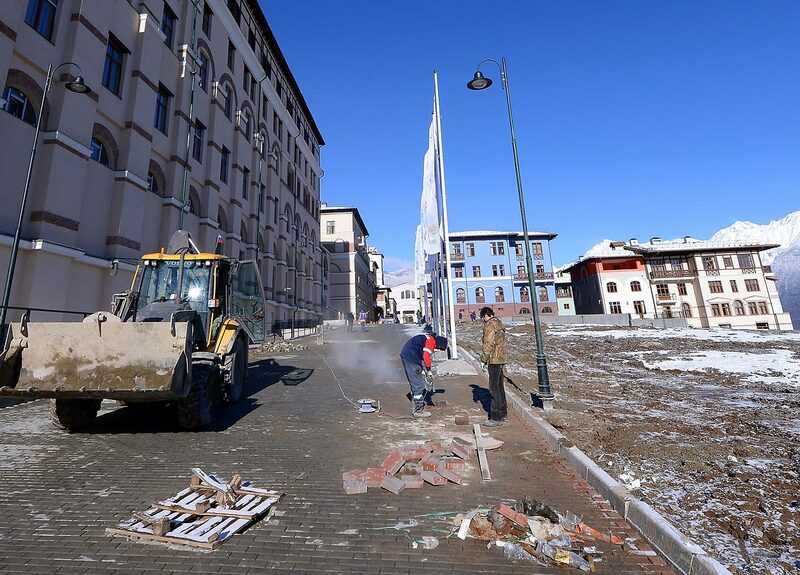 Workmen continue construction at the accommodations in Gorki Village. 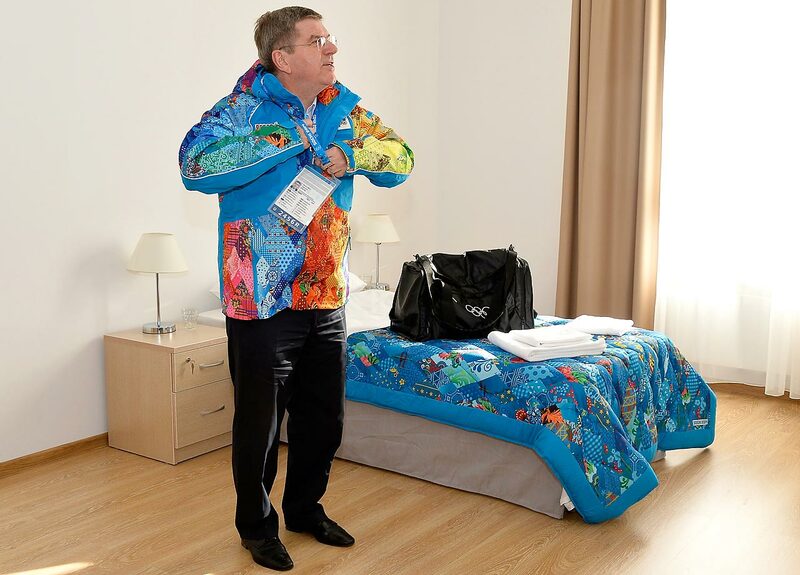 IOC President Thomas Bach looks on in his room in the Athletes Olympic Village. 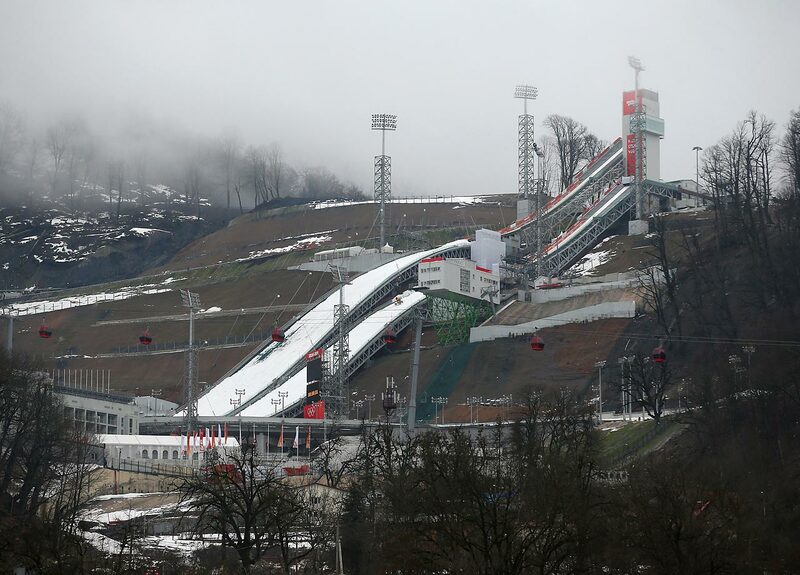 A general view of the RusSki Gorki Ski Jumping venue. 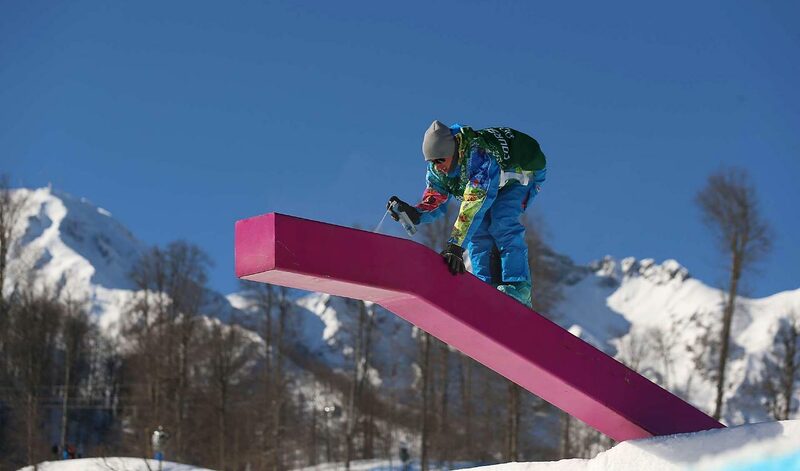 A worker puts on some final touches at the Slopestyle venue. 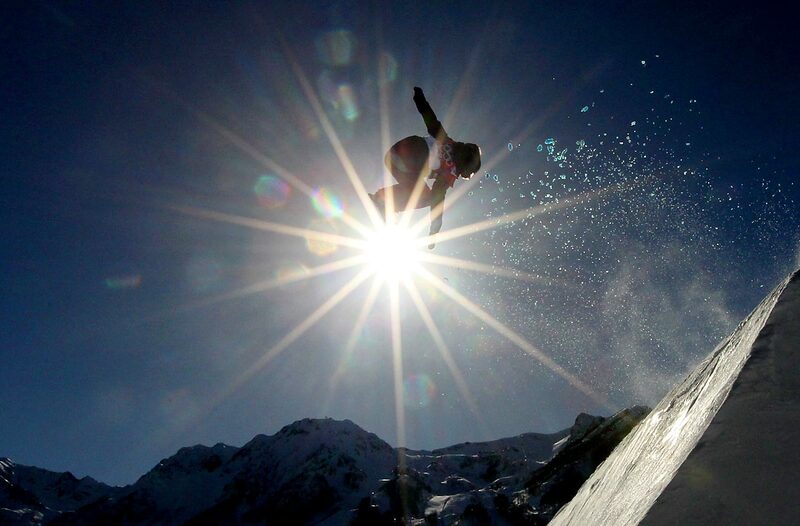 The snowboard slopestyle is a new event at the Winter Olympics. 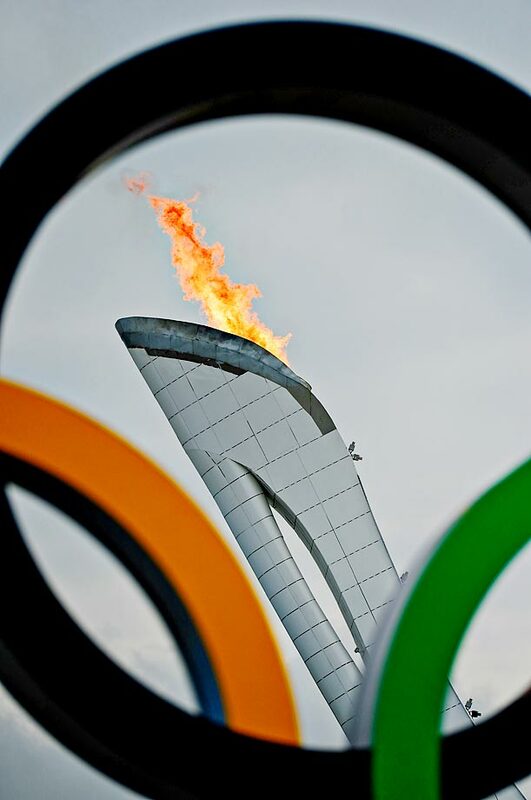 The Olympic Cauldron and Bolshoy Ice Dome are seen ahead of the opening ceremonies. 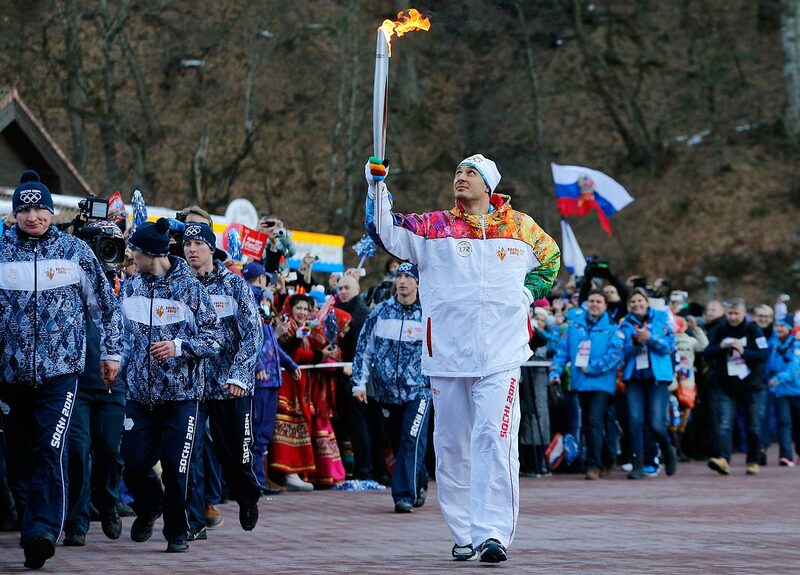 Former Olympic bob sleigher Alexey Voyevoda of Russia carries the Olympic torch in the mountain village of Krasnaya Polyana, Russia, ahead of the Sochi 2014 Winter Olympics. 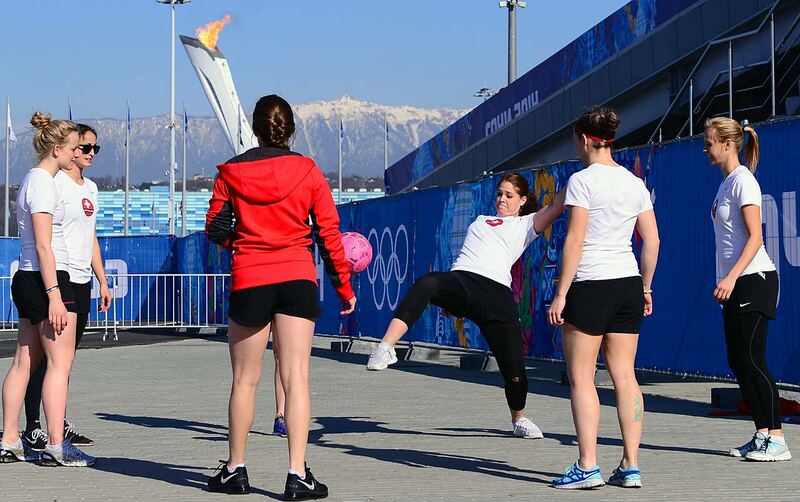 Members of Switzerland's women's ice hockey team warm up at Olympic Park ahead of their practice session. 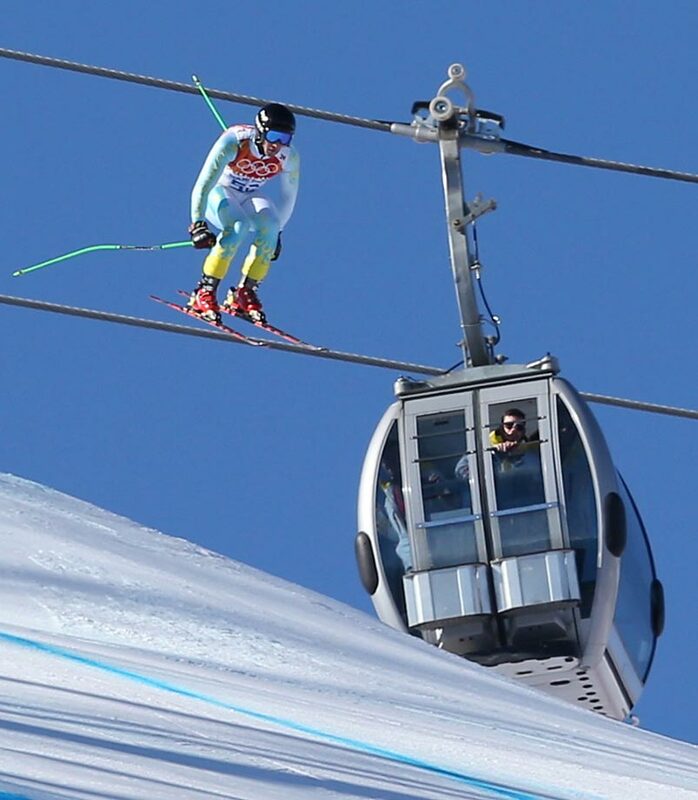 A unidentified competitor during the ladies moguls qualification. 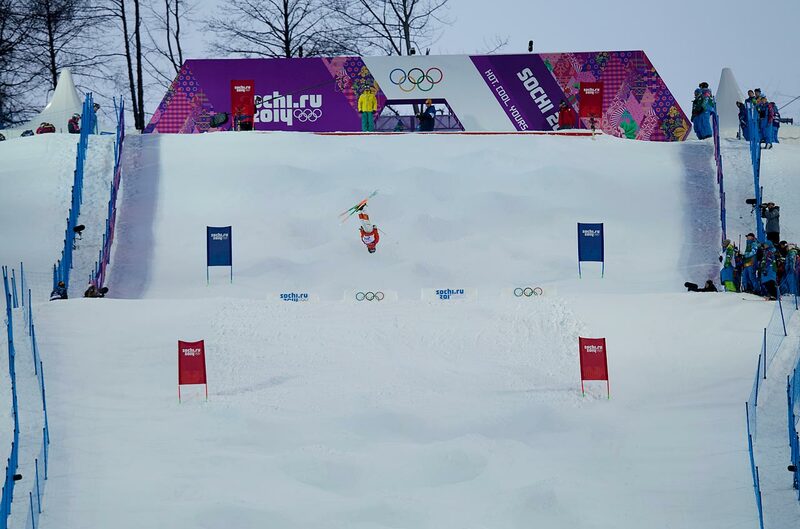 Dominique Ohaco of China practices during training for Ski Slopestyle. 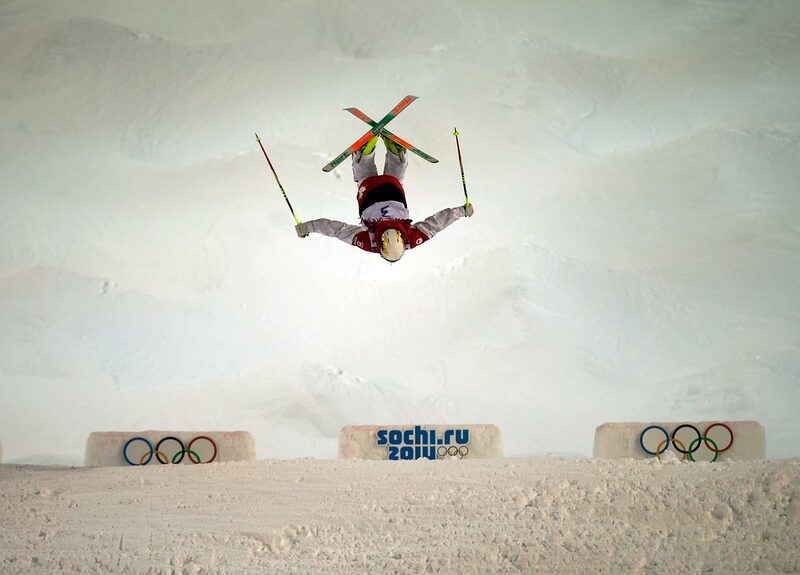 Shelly Gotlieb of New Zealand competes in the Slopestyle qualification. 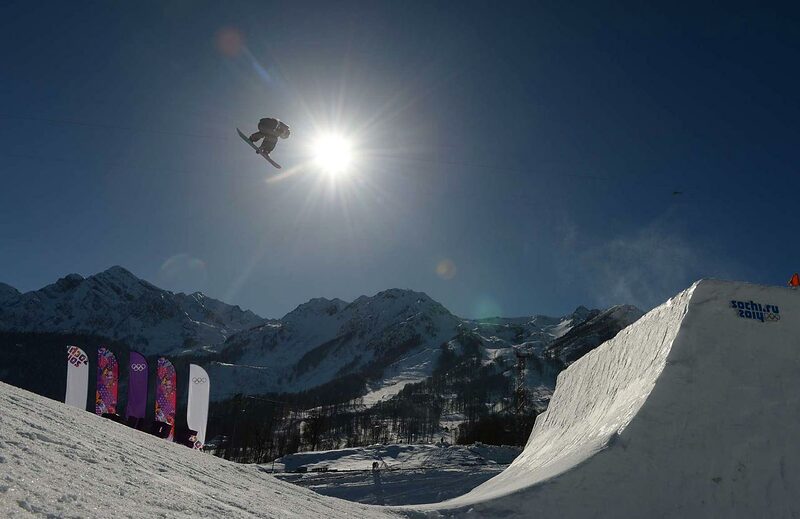 A competitor shows his talents during the Slopestyle Qualification. 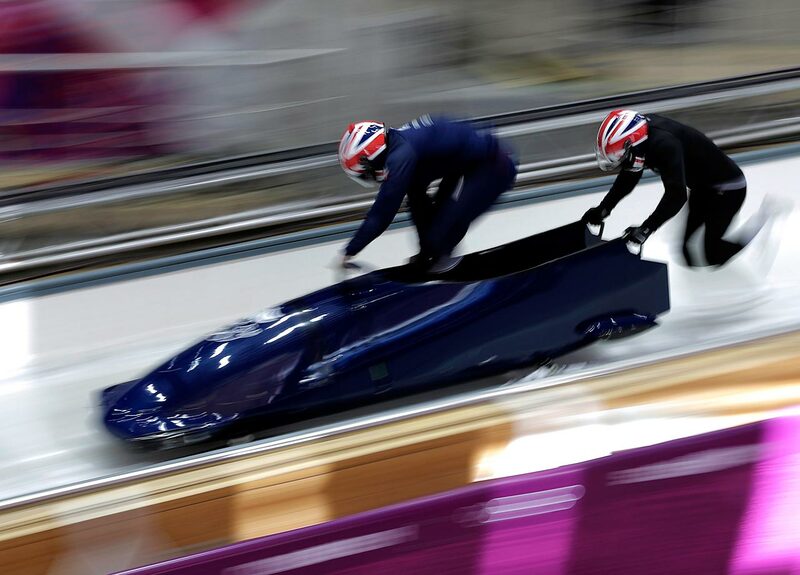 Members of the Great Britain bobsleigh team practice. 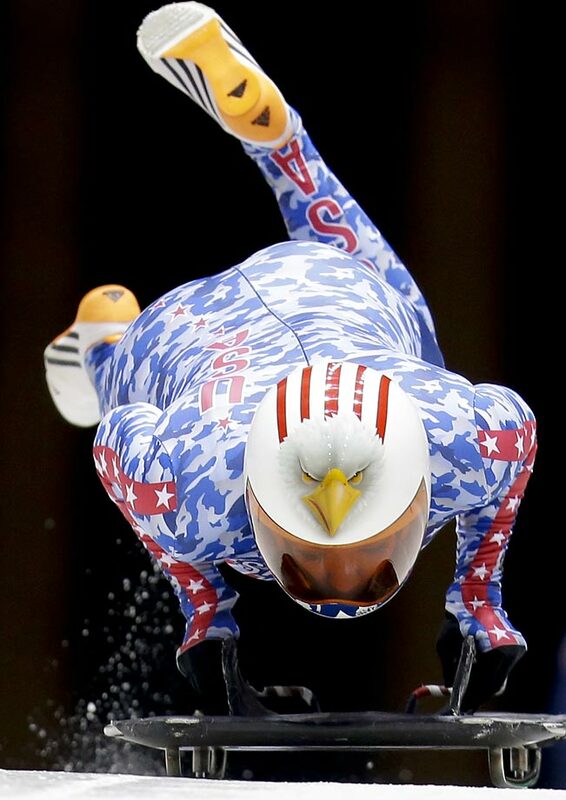 Katie Uhlaender of the United States starts a training run. Sarah Reid from Canada starts her training run. 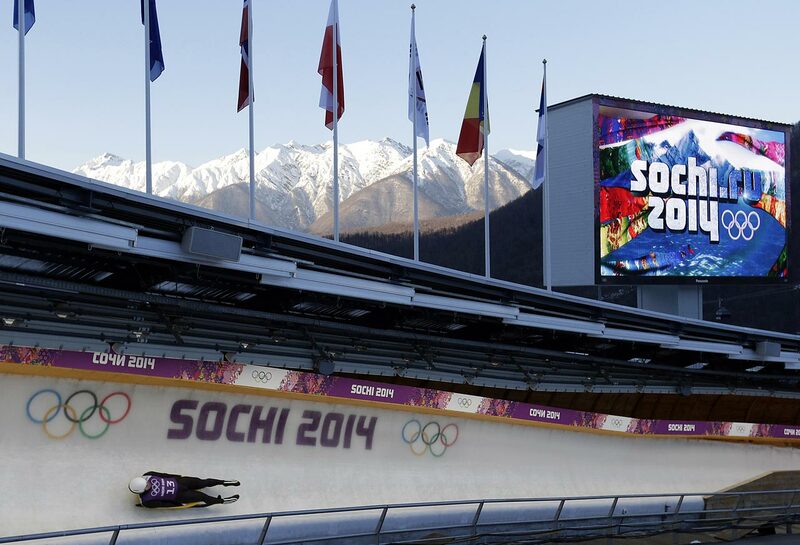 Martins Rubenis of Latvia takes a turn during a training session for the men's singles luge. 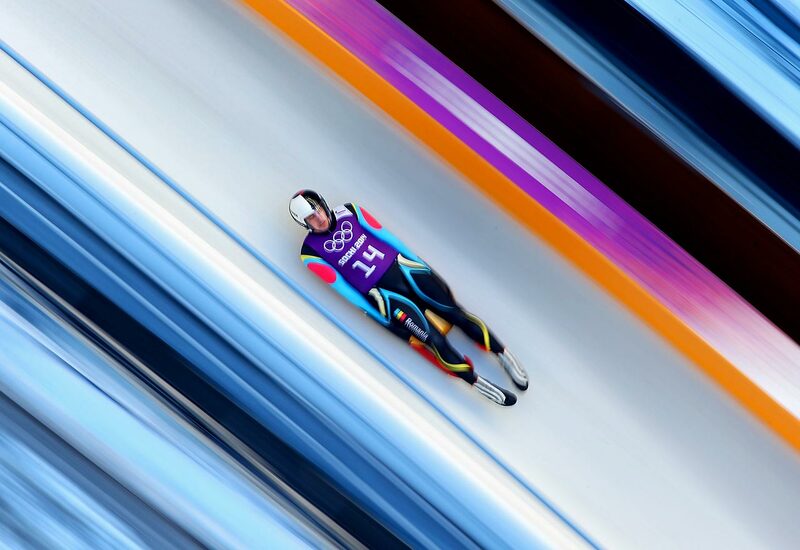 Valentin Cretu of Romania takes part in a men's luge training session. 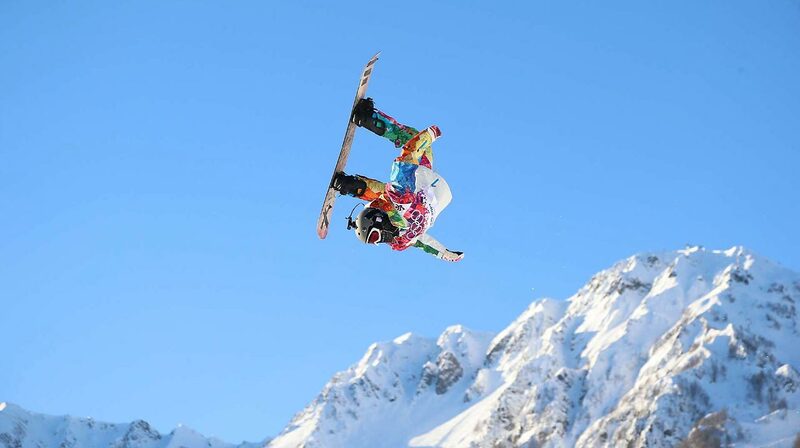 The Snowboard Slopestyle is one of the first events being held. 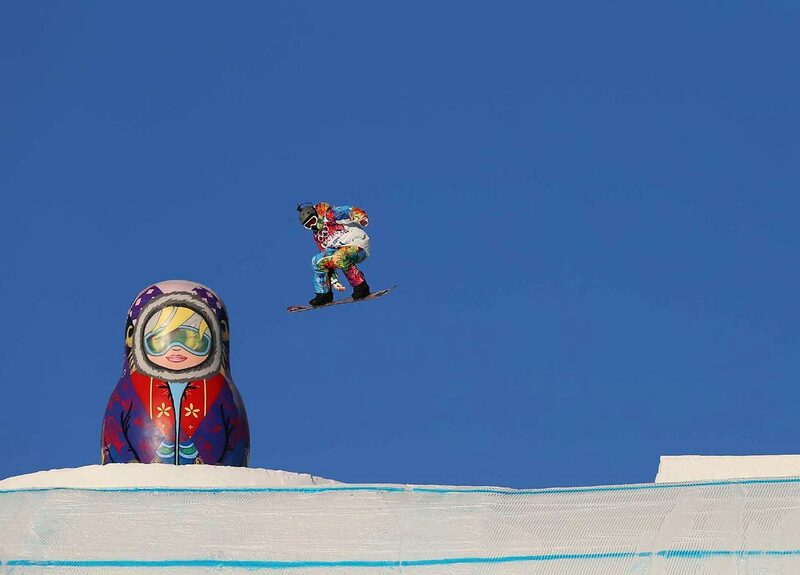 Both men and women will compete in Snowboard Slopestyle. 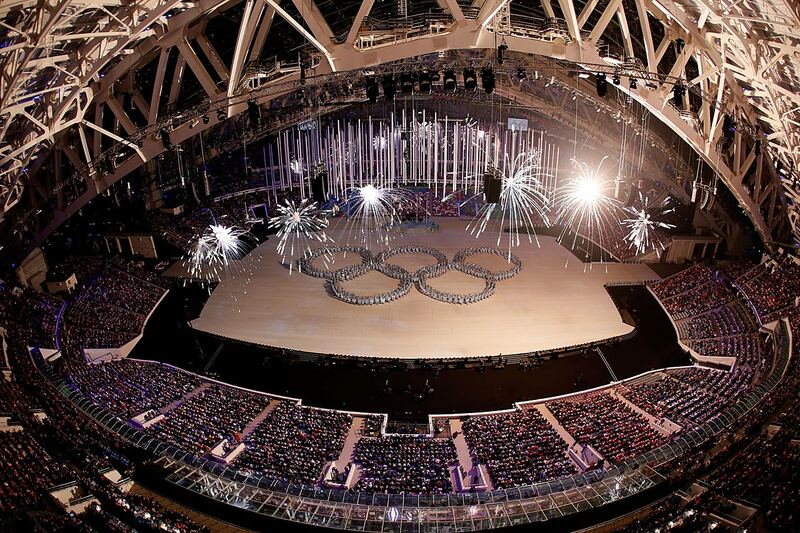 An inside look at the venue for the Team Men Short Program. 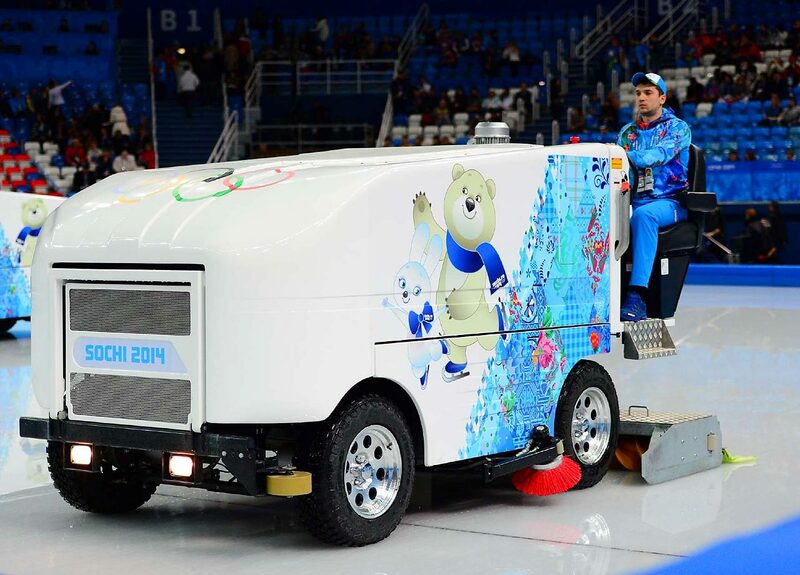 At long last, the Sochi Games are upon us. 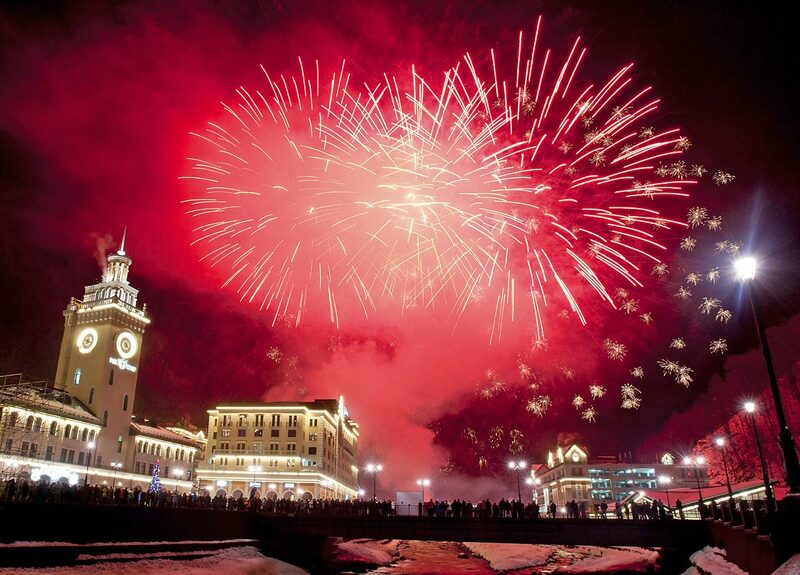 Some of the events will be held at the Rosa Khutor ski resort in Krasnaya Polyana, 60 kilometers (37.5 miles) east of Sochi, shown here during New Year's celebrations.